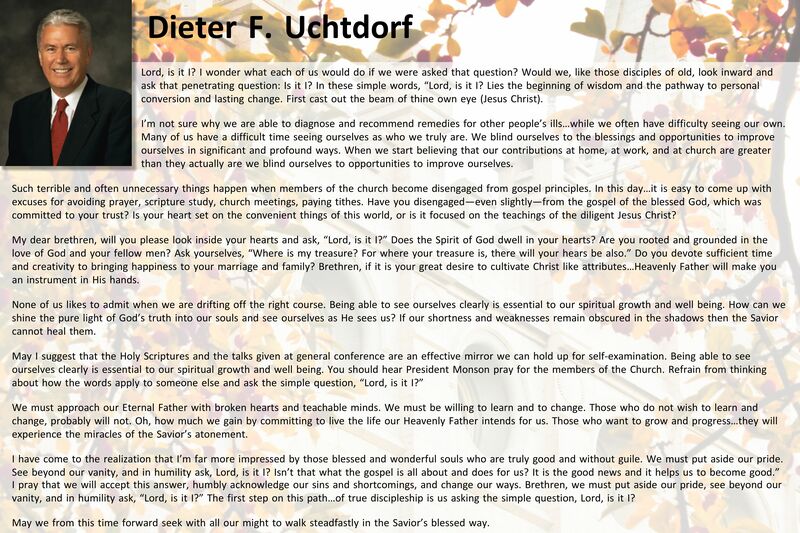 Why is it Important to Teach His Doctrine? 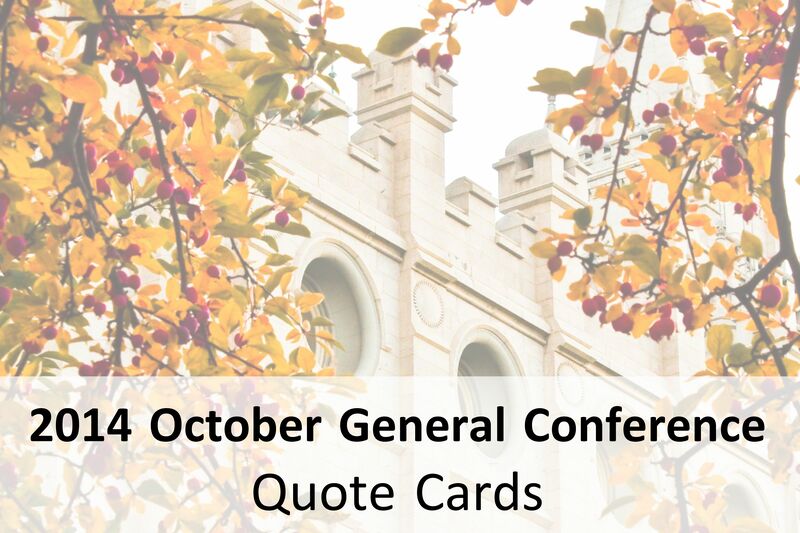 Here are the 2014 October General Conference Quote Cards. It’s taken a week longer to get them posted than I would have liked. I’ve been working on them in the early mornings (the time change here in Hawaii has been a struggle) and between trips to the glorious beaches with my family! There were so many good things shared it became a challenge knowing what to cut to fit everything. I hope what has been included helps YOU. 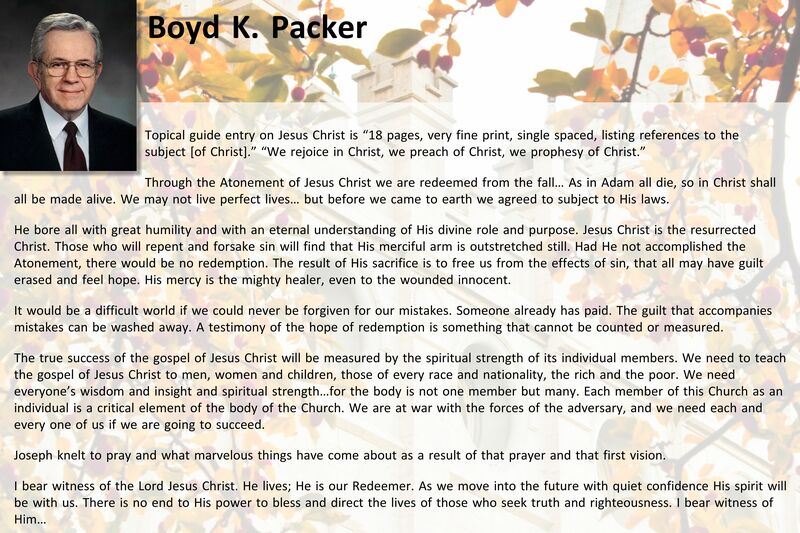 I add my testimony and witness of Jesus Christ to these faithful servants, leaders, apostles and prophets of God. Cards are organized in alphabetical order by first name. 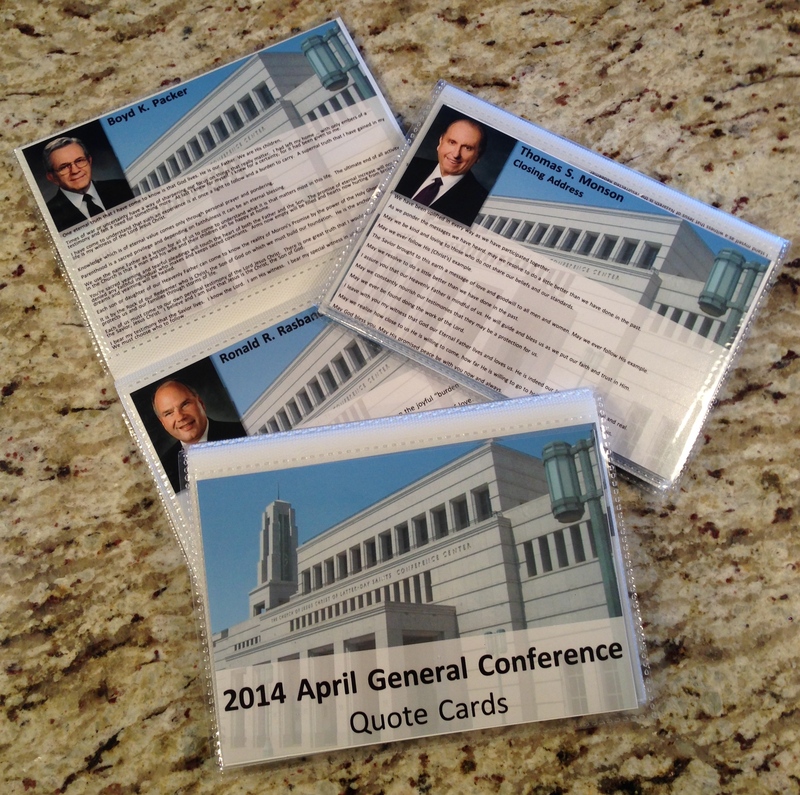 You will see there are additional cards for those that gave messages in multiple sessions of Conference, including Priesthood and Women’s Meetings. Download in .jpg or .pdf formats. 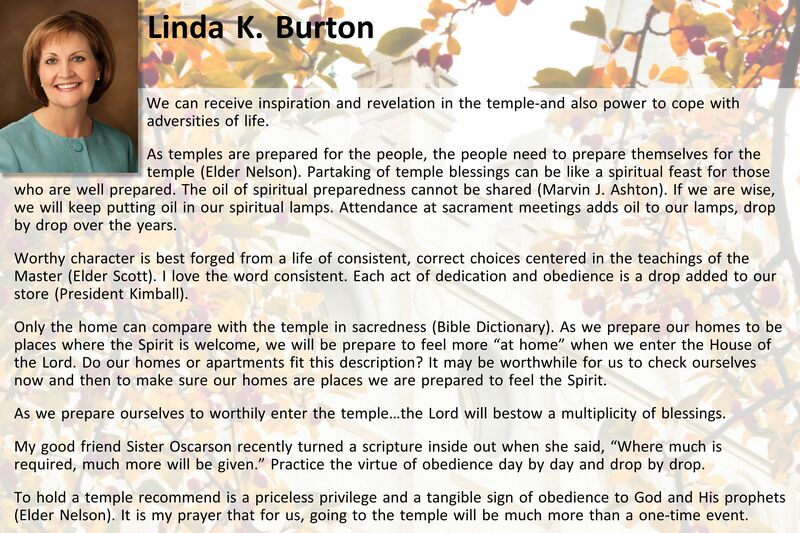 Activity Suggestion: Gather your family, or in an upcoming church class or activity, discuss what was taught at General Conference. Have each person choose a card, then invite participation through reading quotes, expressing feelings and sharing testimony. Consider asking questions to help class members think deeply, creating meaningful discussion. 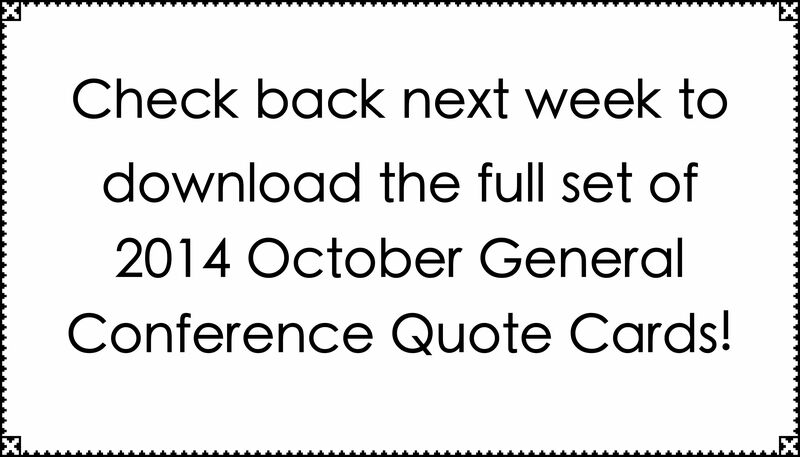 Printing Tip: Download Conference Quote Cards from all sessions (.jpeg) by dragging each image to desktop or clicking on it. For for a larger file size, choose (.pdf) versions below. I submit the .jpeg images to Costco Photo to have them printed on photo paper (4×6) for easy reading. I keep them in a simple, plastic sleeve photo album that fits inside most scripture bags (see example). What message has moved you to action? 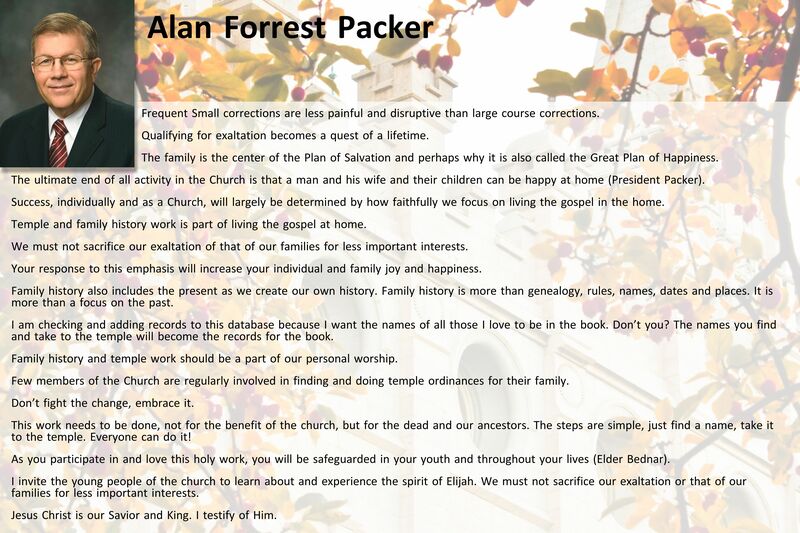 PDF: General Conference Quote Cards COVER, Alan Forrest Packer, Boyd K. Packer, Carlos A. Godoy, Carol F. McConkie, Cheryl C. Esplin, Chi Hong (Sam) Wong, Craig C. Christensen, Dallin H. Oaks, David A. Bednar, Dean M. Davis, Dieter F. Uchtdorf, Dieter F. Uchtdorf, Dieter F. Uchtdorf, Eduardo Gavarret, Elder D. Todd Christofferson, D. Todd Christofferson, Henry B. Eyring, Henry B. Eyring, Hugo E. Martinez, James J. Hamula, Jean A. Stevens, Jeffery R. Holland, Jorg Klebingat, L. Tom Perry, Larry S. Kacher, Linda K. Burton, Lynn G. Robbins, M. Russell Ballard, Neil L. Anderson, Neill F. Marriott, Quentin L. Cook, Richard G. Scott, Robert D. Hales, Russell M. Nelson, Tad R. Callister, Thomas S. Monson, Thomas S. Monson, Thomas S. Monson. 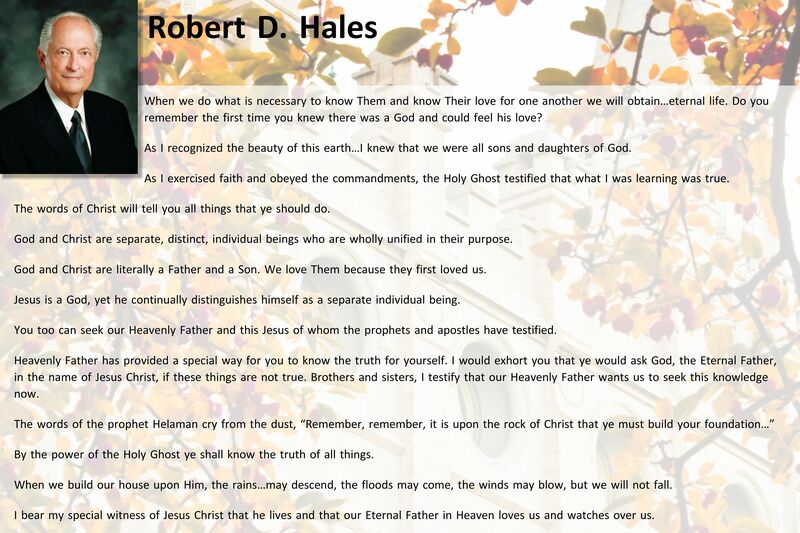 Background image from LDS.org. Watch, listen or print full versions of talks here. Why is there so much suffering? Does life have a purpose? How can I be a better person? Have you ever found yourself asking these questions? Find answers through General Conference. 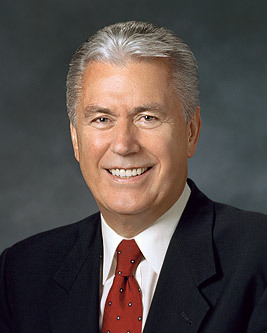 President Dieter F. Uchtdorf teaches that if you think of some questions before general conference, the Lord can speak to you through His prophets and apostles during conference. 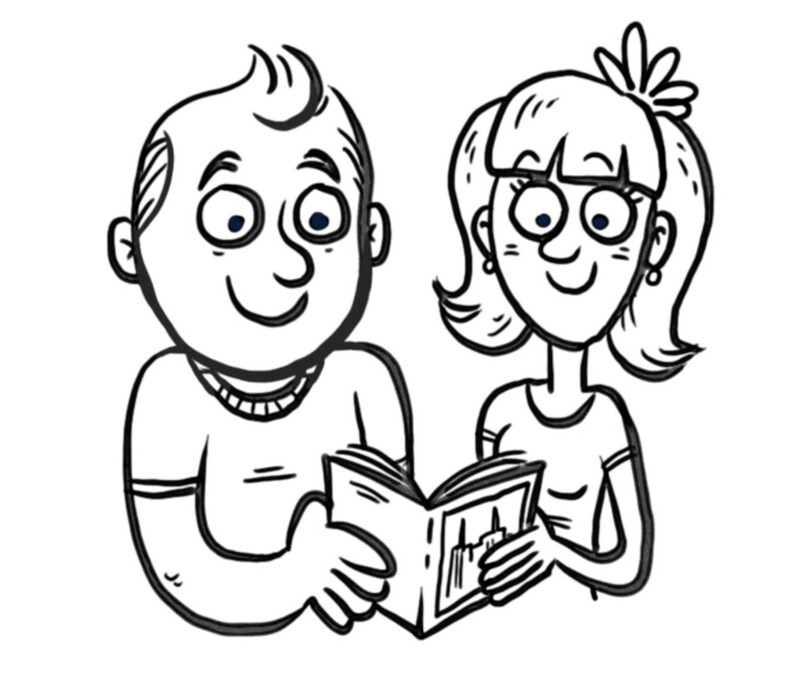 As a family or class, discuss what you would like to learn more about, either individually or together. (For example: How can I strengthen my testimony of Joseph Smith? How can I fix a problem at school or with friends?) On a piece of paper or in your journal, write down your questions. 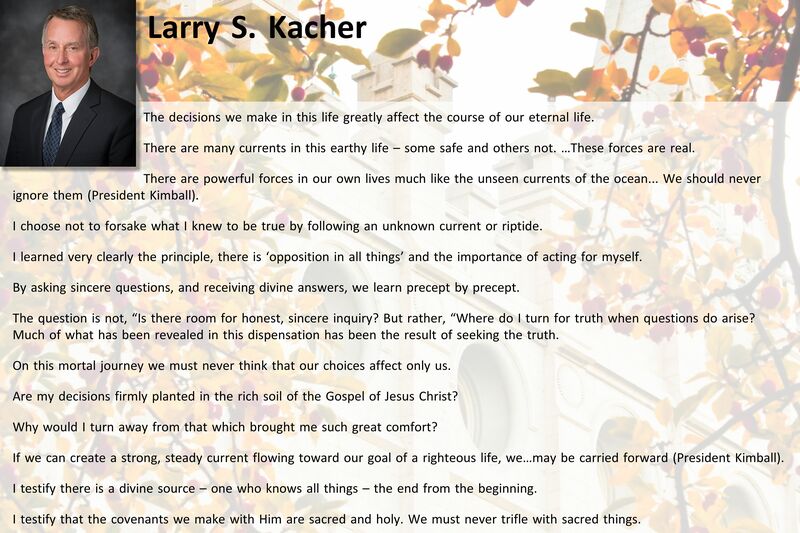 Before conference begins think and pray about these questions. Listen carefully during conference (it may be helpful to take notes), then write how the Lord—through Church leaders—answered your questions. 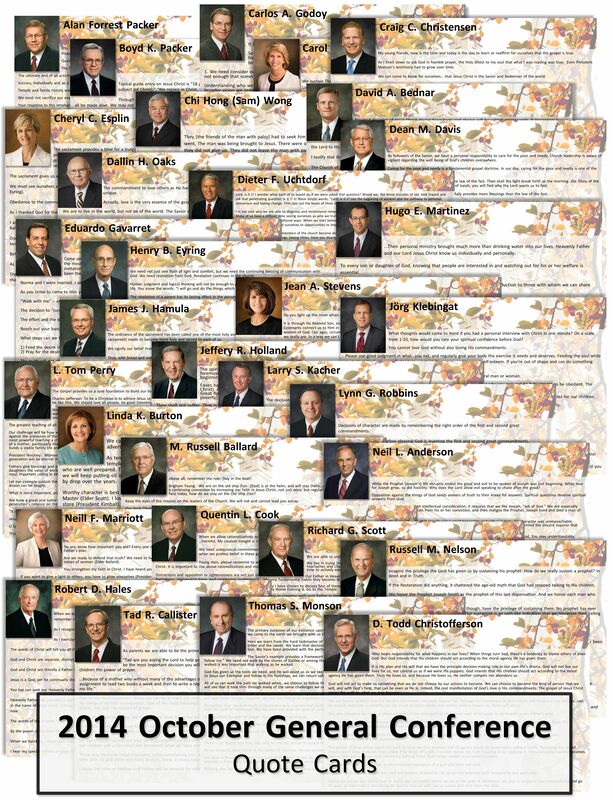 Come listen to living prophets this Saturday and Sunday, October 4th and 5th. 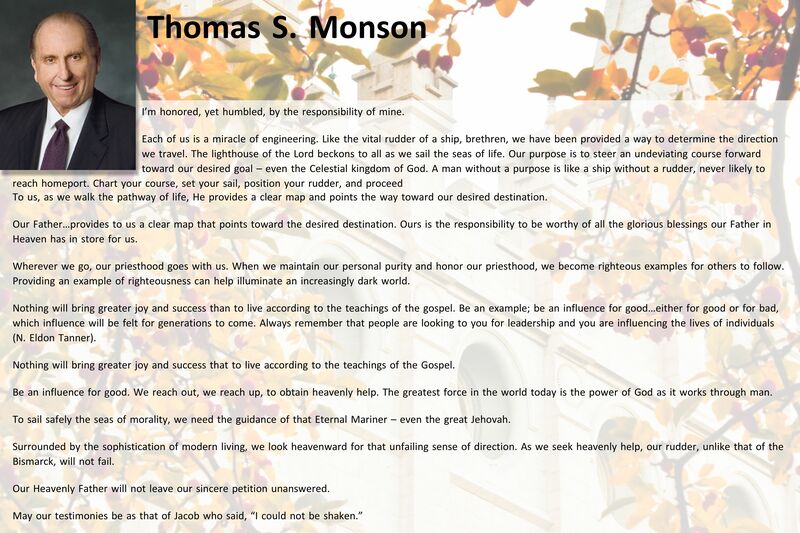 Watch online (LDS.org, YouTube, Mormon Channel, BYUtv) or at a local meeting house. 1. 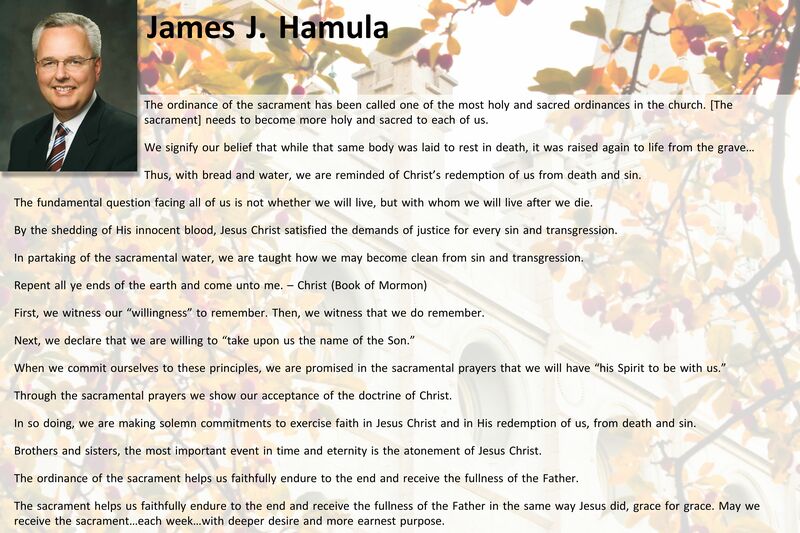 Members of the Church are entitled to personal revelation as they listen to and study the inspired words spoken at general conference. 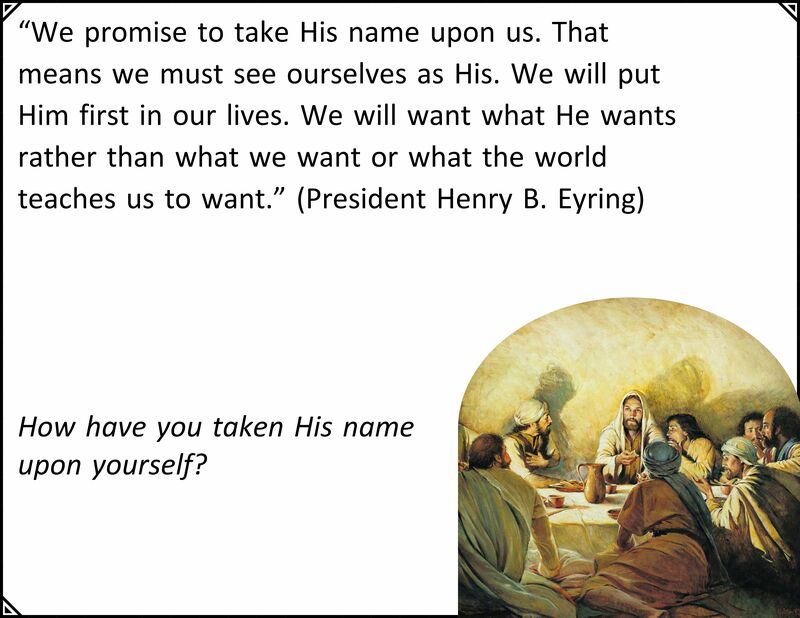 As you prepare for general conference, I invite you to ponder questions you need to have answered. 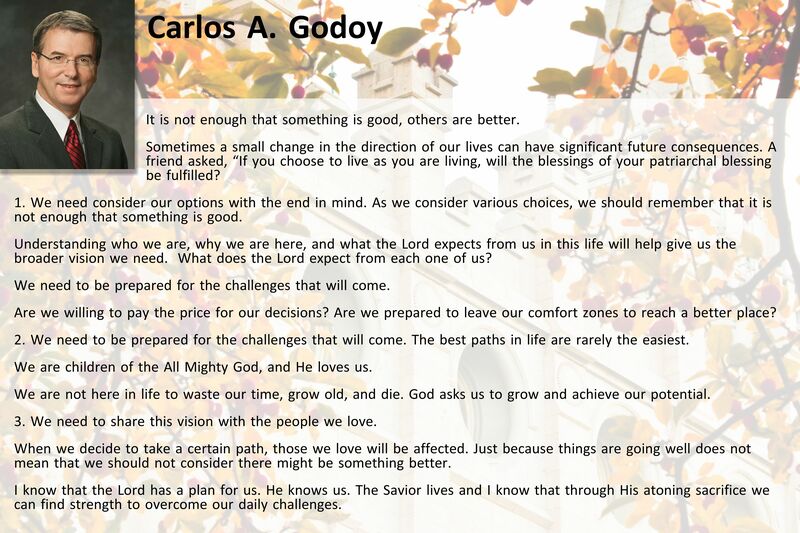 For example, you might yearn for direction and guidance by the Lord regarding challenges you are facing. Answers to your specific prayers may come directly from a particular talk or from a specific phrase. At other times answers may come in a seemingly unrelated word, phrase, or song. A heart filled with gratitude for the blessings of life and an earnest desire to hear and follow the words of counsel will prepare the way for personal revelation. 2. Don’t discount a message merely because it sounds familiar. Prophets have always taught by repetition; it is a law of learning. 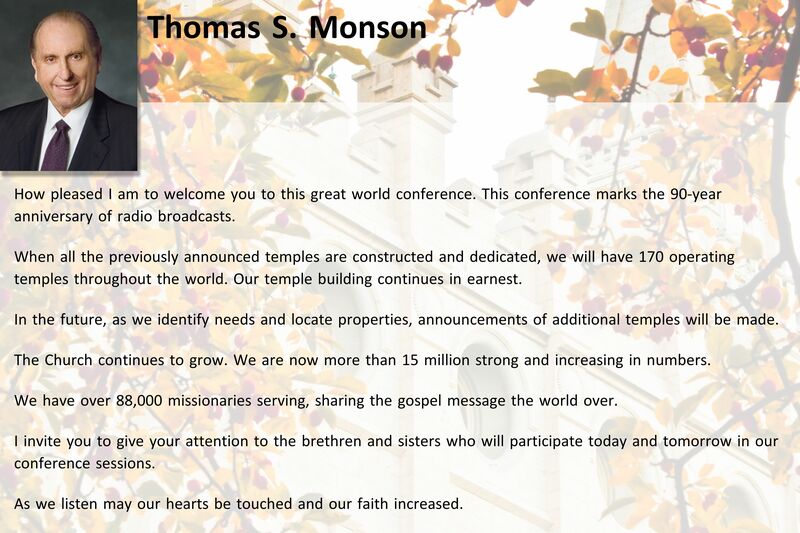 You will hear repetition in themes and doctrines in general conference. Let me reassure you: this is not due to a lack of creativity or imagination. 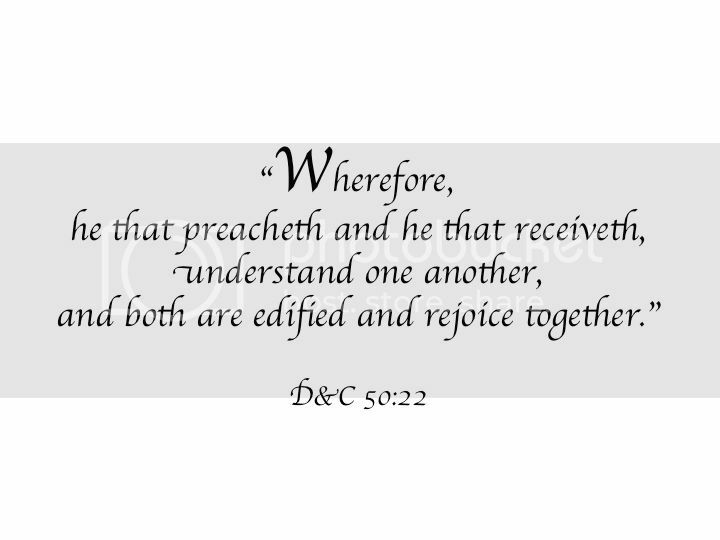 We continue to hear messages on similar issues because the Lord is teaching and impressing upon our minds and hearts certain foundational principles of great eternal importance that must be understood and acted upon before we can move on to other things. 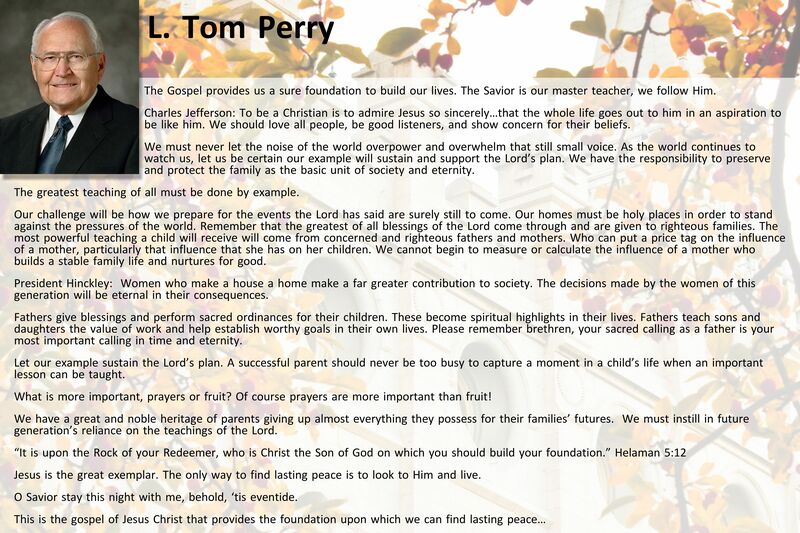 A wise builder first lays the foundation before erecting the walls and the roof. 3. 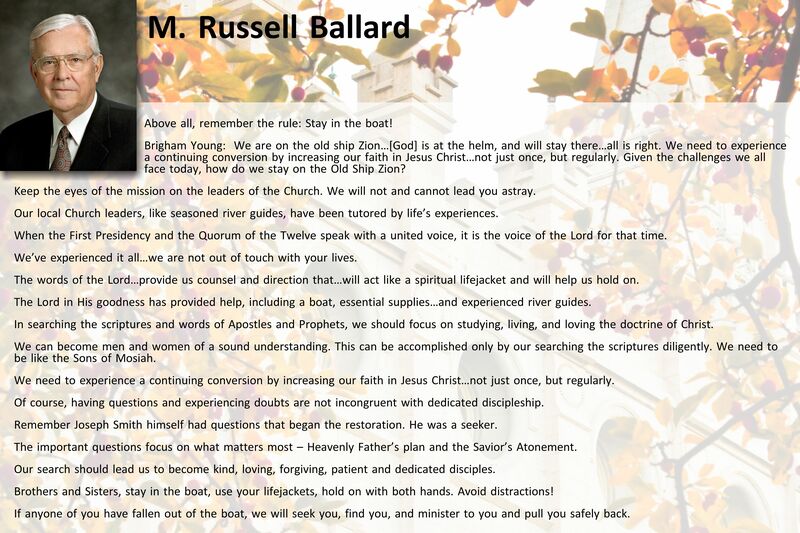 The words spoken at general conference should be a compass that points the way for us during the coming months. 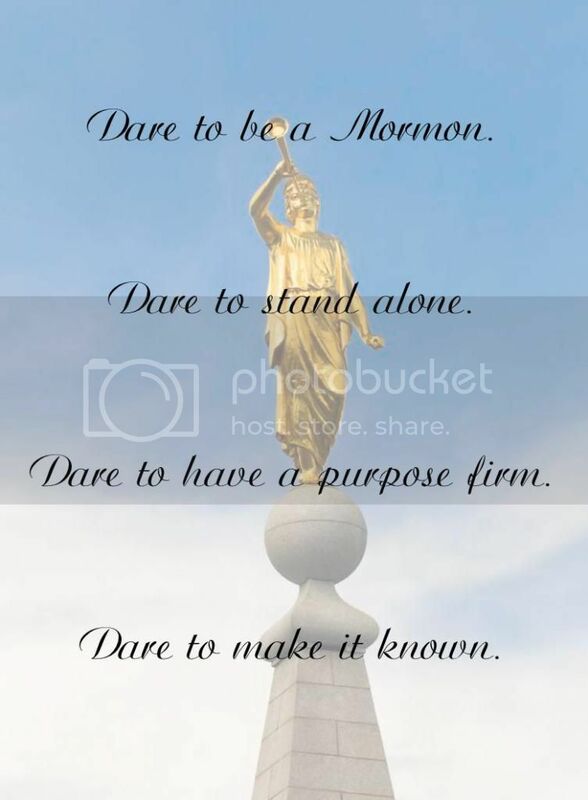 If we listen to and follow the promptings of the Spirit, they will serve as a Liahona, guiding us through the unknown, challenging valleys and mountains that are ahead (see 1 Nephi 16). Since the world began, God has raised up prophets who speak the will of heaven to the people of their times. It is our responsibility to listen and then apply the messages the Lord provides for us. Our merciful and loving Heavenly Father has not forsaken and will not forsake His children. 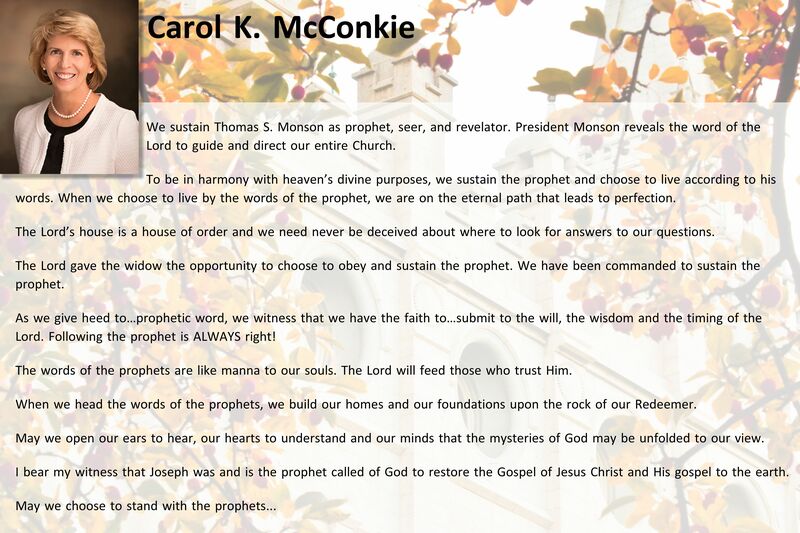 Today, as well as in times past, He has appointed apostles and prophets. He continues to reveal His word to them. 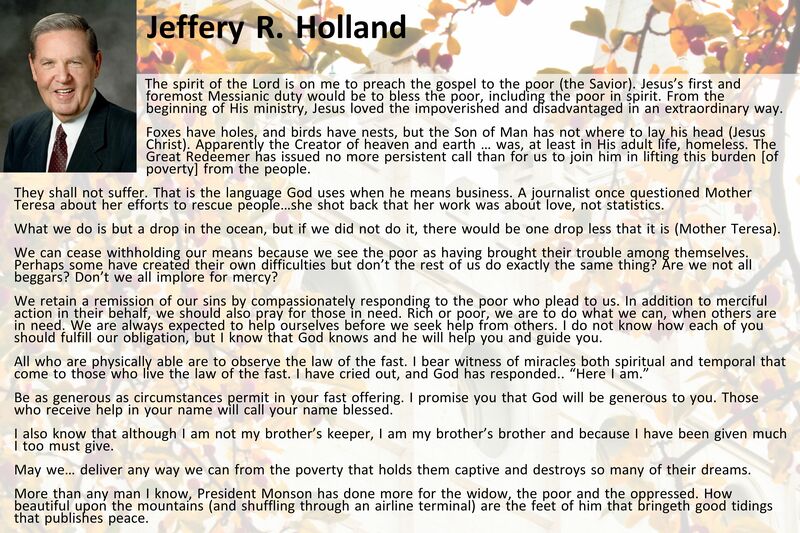 What a marvelous privilege it is to hear God’s messages for each of us during general conference! 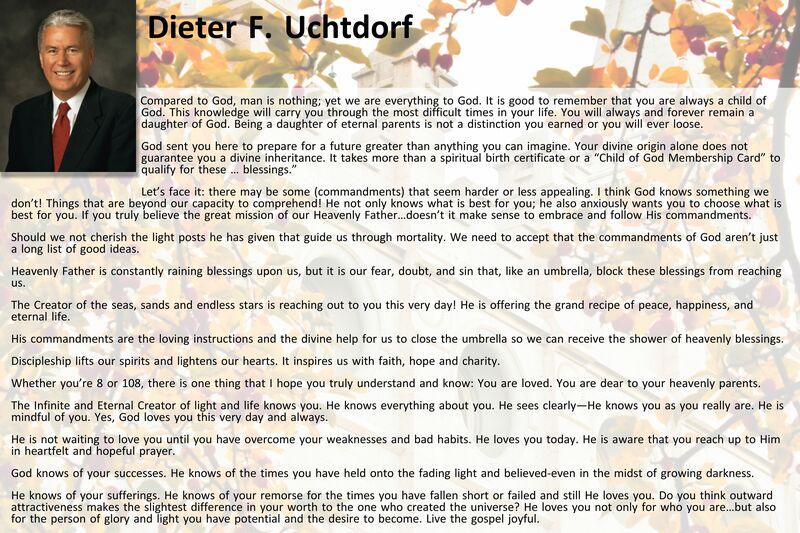 Let us prepare well for this great blessing of divine guidance delivered by His chosen servants. 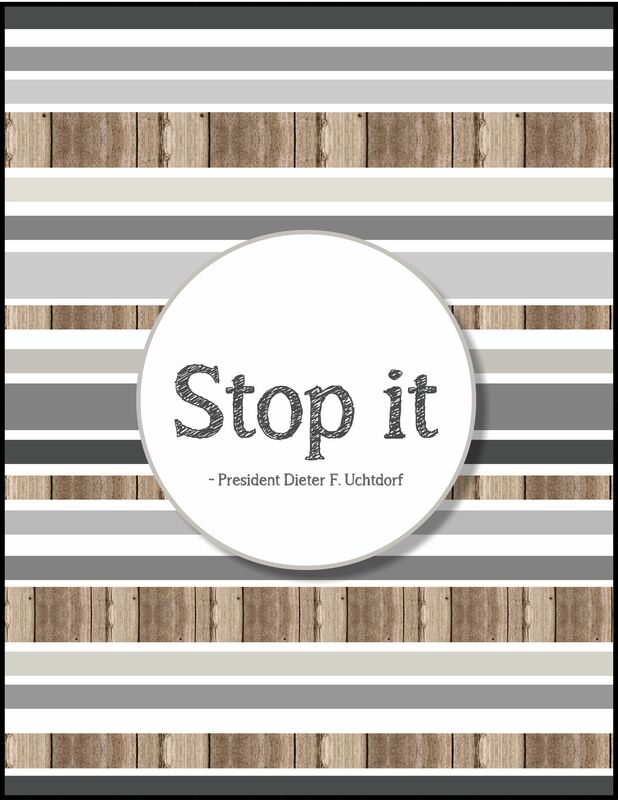 Consider printing the following conference activities to help your younger children stay engaged and listening during conference: General Conference Notebook, Conference Squares, and Conference Coloring Pages. Today’s post is a little different from my others in form, but certainly not in content or validity. 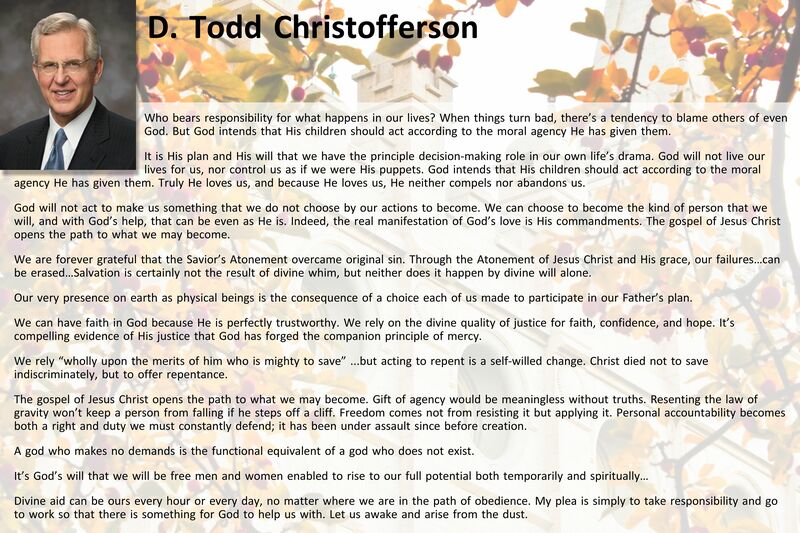 When you first read it you might wonder how it fits into this month’s doctrine from Come Follow Me, but ponder on it and I think you’ll agree it has a place in every doctrine and principle taught in the Church. It’s consumed my thoughts for a month now and I know it’s something every single one of us has experienced or felt at one point or another. Let me add, I only know a small percentage of the readers of this blog. In fact, I bet I could count those individuals on one hand. It means a lot to me that each of you, with varying religious practices and beliefs, are trying to live their lives the best way they can and taking time to read this blog. Thank you. That thought is really quite humbling to me. Although we do not know each other on a personal level, our beliefs unite and make us the same. 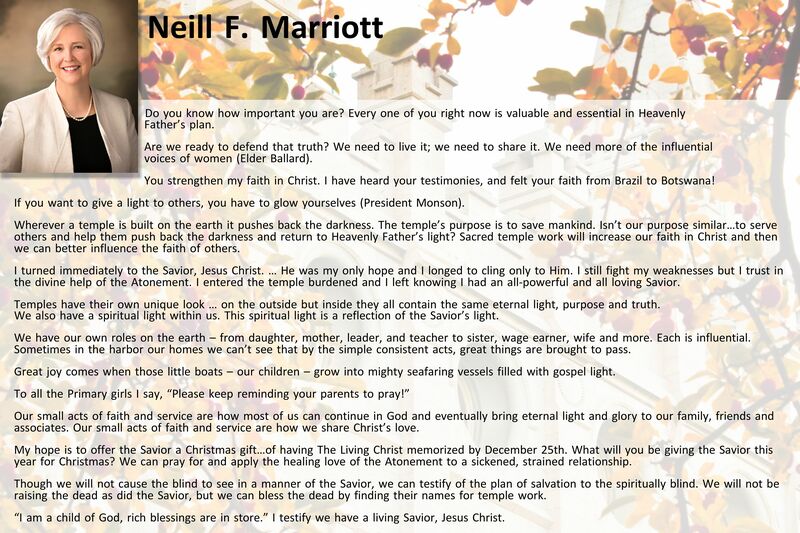 We believe in the Savior, Jesus Christ. We look to him as our example in all things. So really, when you think about it, we are more alike than different, we have more in common than not, and each one of us have the ability to make things better in the world. 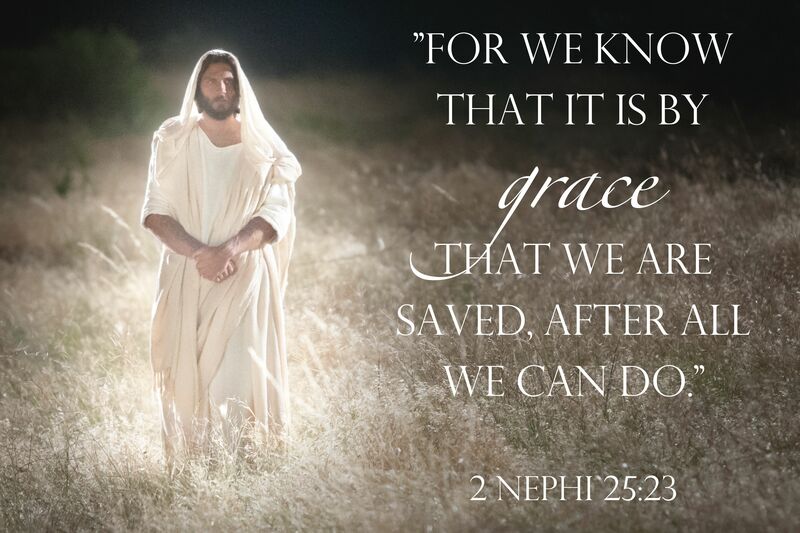 The Savior’s atoning sacrifice has enabled us with the power to do it. We must use that strength every day and make a difference – We are the difference! 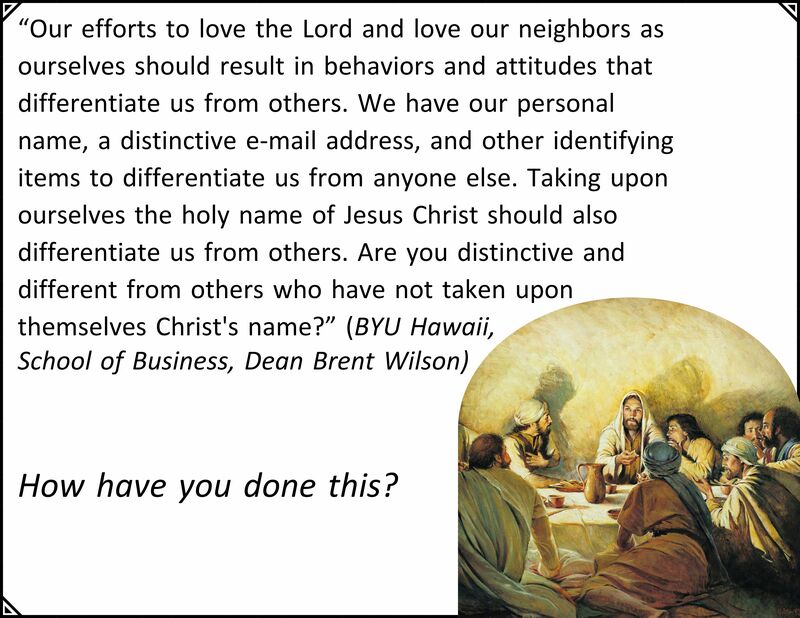 This topic of judging others could actually be taught in a two-word sermon. When it comes to hating, gossiping, ignoring, ridiculing, holding grudges, or wanting to cause harm, please apply the following: Stop it! We must recognize that we are all imperfect—that we are beggars before God. Haven’t we all, at one time or another, meekly approached the mercy seat and pleaded for grace? Haven’t we wished with all the energy of our souls for mercy—to be forgiven for the mistakes we have made and the sins we have committed? Because we all depend on the mercy of God, how can we deny to others any measure of the grace we so desperately desire for ourselves? My beloved brothers and sisters, should we not forgive as we wish to be forgiven? . . . The people around us are not perfect (see Romans 3:23). People do things that annoy, disappoint, and anger. In this mortal life it will always be that way. 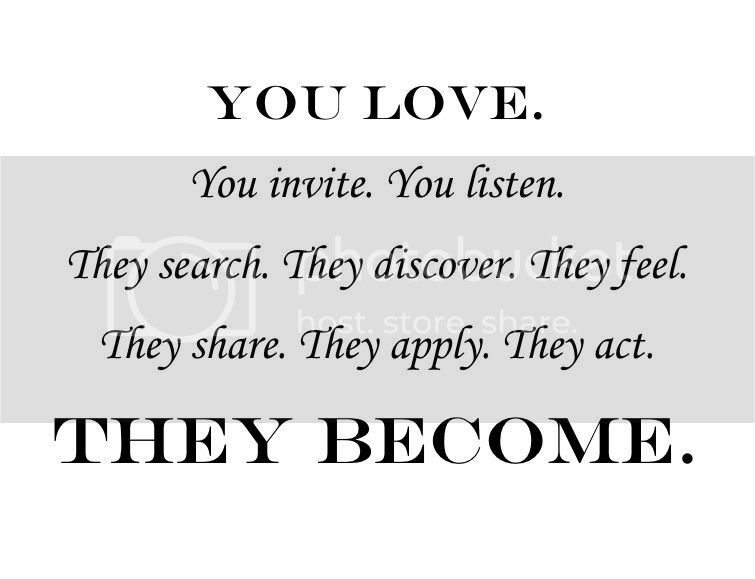 I couldn’t let the day pass without sharing this…maybe it will help you change the way you truly “see” others today. Teaching Tip: Write down a few questions before class begins that invite discussion and personal experience based on judging. 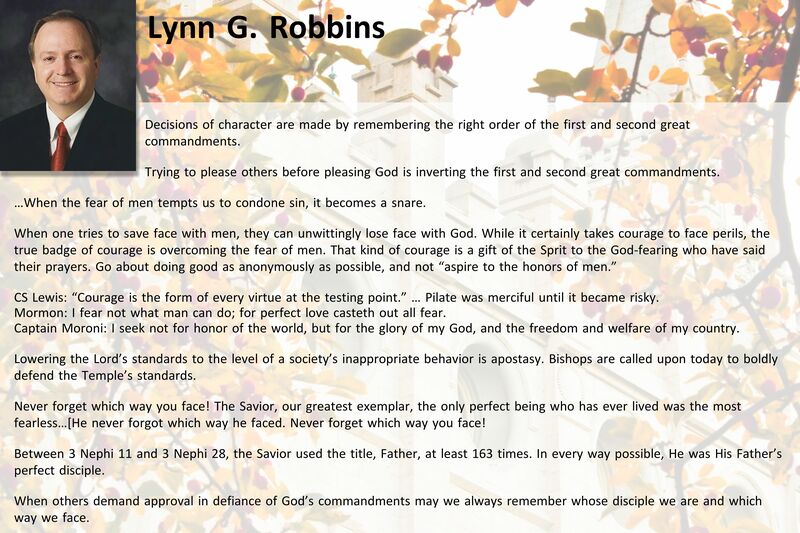 For example, What do the scriptures teach about judging others? How might judging someone stall or stop your efforts in making friends or caring for those around you? 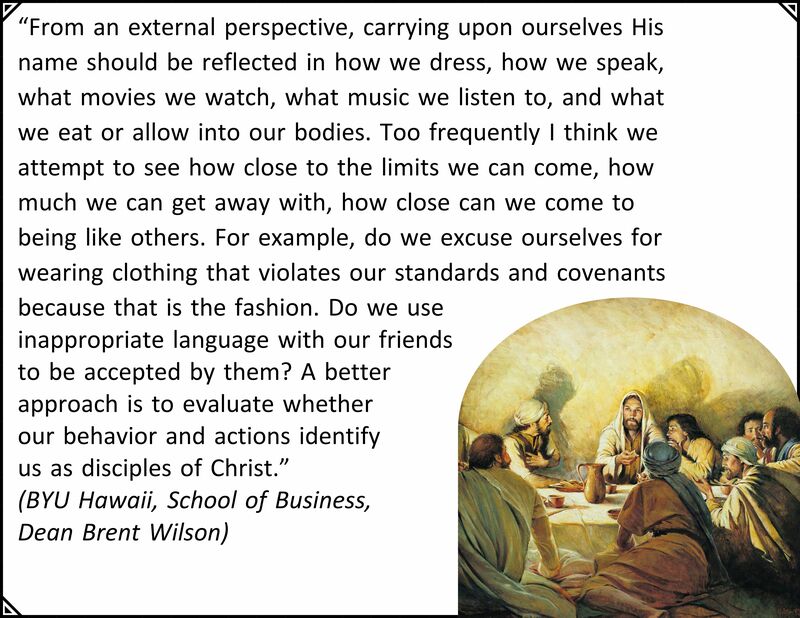 What can we learn from the Savior’s example about not judging others? Invite the youth to make lists of the differences. I helped them by sharing stories of girls I have known in my life on both sides. Lay hold upon every good gift, and touch not the evil gift, nor the unclean thing. One who uses the God-given body of another without divine sanction abuses the very soul of that individual, abuses the central purpose and processes of life. In approaching this subject I do not document a host of social ills for which the statistics are as grim as the examples are offensive. Nor will I present here a checklist of do’s and don’ts about dating and boy-girl relationships. What I wish to do is more personal—I wish to try to answer questions some of you may have been asking: Why should we be morally clean? Why is it such an important issue to God? 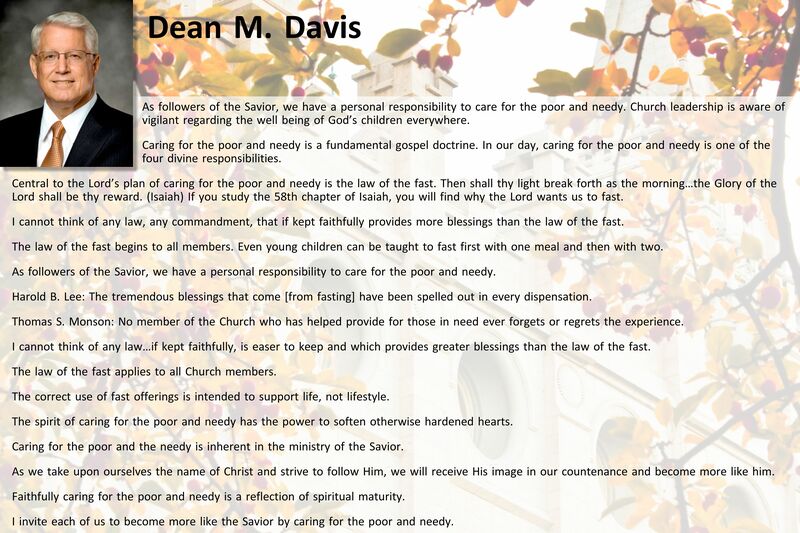 Does the Church have to be so strict about it when others don’t seem to be? How could anything society exploits and glamorizes so openly be very sacred or serious? By assigning such seriousness to a physical appetite so universally bestowed, what is God trying to tell us about its place in His plan for all men and women? I submit to you He is doing precisely that—commenting about the very plan of life itself. Clearly among His greatest concerns regarding mortality are how one gets into this world and how one gets out of it. He has set very strict limits in these matters. Fortunately, in the case of how life is terminated, most seem to be quite responsible. But in the significance of giving life, we sometimes find near-criminal irresponsibility. May I offer three reasons why this is an issue of such magnitude and consequence in the gospel of Jesus Christ. 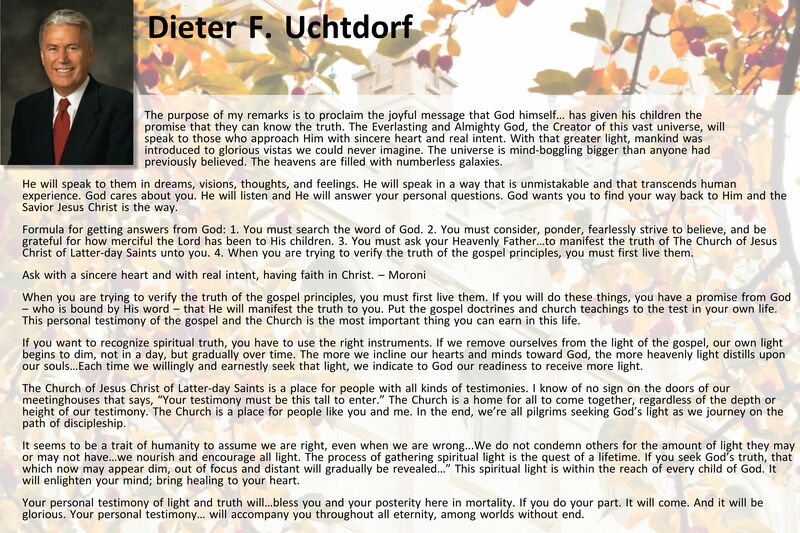 First is the revealed, restored doctrine of the human soul. 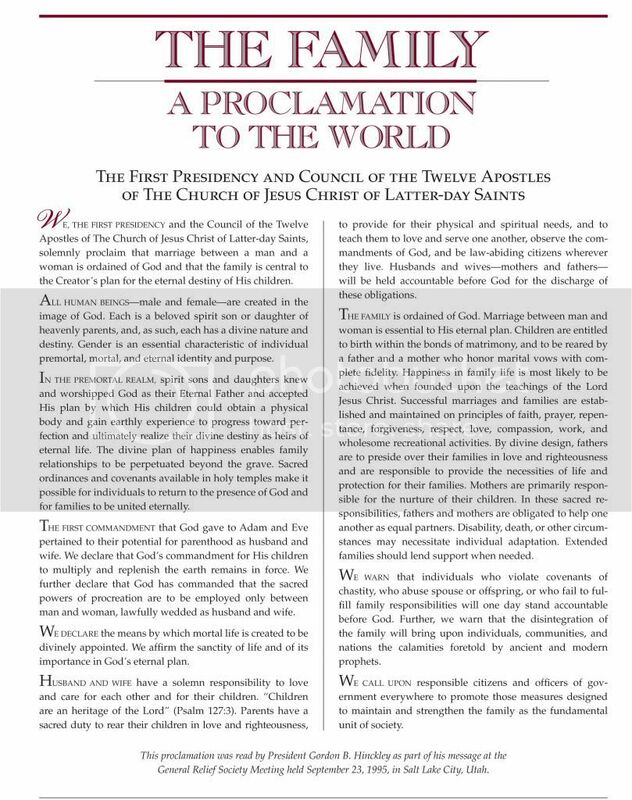 One of the “plain and precious” truths restored in this dispensation is that “the spirit and the body are the soul of man” 5 and that when the spirit and body are separated, men and women “cannot receive a fulness of joy.” 6 That is the reason why obtaining a body is so fundamentally important in the first place,why sin of any kind is such a serious matter (namely because it is sin that ultimately brings both physical and spiritual death), and why the resurrection of the body is so central to the great triumph of Christ’s Atonement. The body is an essential part of the soul. 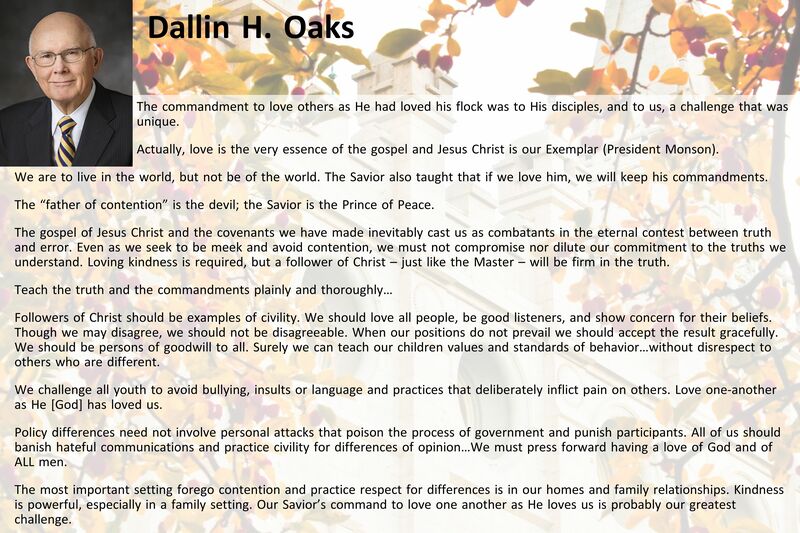 This distinctive and very important Latter-day Saint doctrine underscores why sexual sin is so serious. 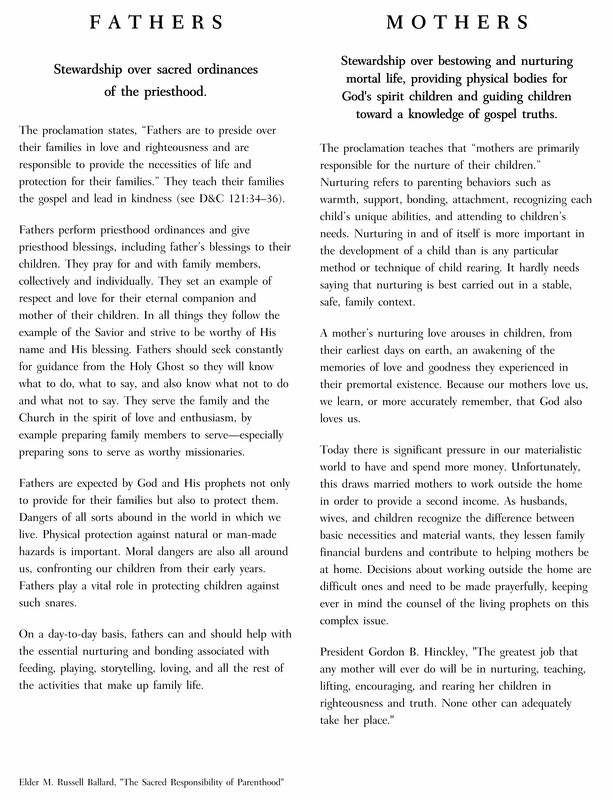 We declare that one who uses the God-given body of another without divine sanction abuses the very soul of that individual, abuses the central purpose and processes of life, “the very key” 7 to life, as President Boyd K. Packer once called it. In exploiting the body of another—which means exploiting his or her soul—one desecrates the Atonement of Christ, which saved that soul and which makes possible the gift of eternal life. And when one mocks the Son of Righteousness, one steps into a realm of heat hotter and holier than the noonday sun. You cannot do so and not be burned. Please, never say: “Who does it hurt? Why not a little freedom? I can transgress now and repent later.” Please don’t be so foolish and so cruel. You cannot with impunity “crucify Christ afresh.” 8 “Flee fornication,” 9 Paul cries, and flee “anything like unto it,” 10 the Doctrine and Covenants adds. Why? Well, for one reason because of the incalculable suffering in both body and spirit endured by the Savior of the world so that we could flee. 11 We owe Him something for that. Indeed, we owe Him everything for that. “Ye are not your own,” Paul says. “Ye [have been] bought with a price: therefore glorify God in your body, and in your spirit, which are God’s.” 12 In sexual transgression the soul is at stake—the body and the spirit. Secondly, may I stress that human intimacy is reserved for a married couple because it is the ultimate symbol of total union, a totality and a union ordained and defined by God. From the Garden of Eden onward, marriage was intended to mean the complete merger of a man and a woman—their hearts, hopes, lives, love, family, future, everything. Adam said of Eve that she was bone of his bones and flesh of his flesh, and that they were to be “one flesh” in their life together. 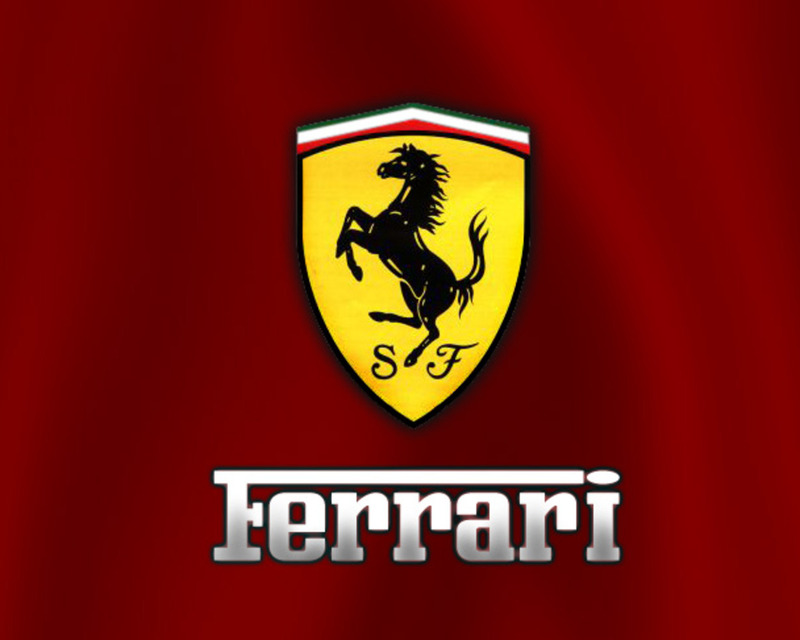 13 This is a union of such completeness that we use the word seal to convey its eternal promise. The Prophet Joseph Smith once said we perhaps could render such a sacred bond as being “welded” 14 one to another. But such a total union, such an unyielding commitment between a man and a woman, can only come with the proximity and permanence afforded in a marriage covenant, with solemn promises and the pledge of all they possess—their very hearts and minds, all their days and all their dreams. Can you see the moral schizophrenia that comes from pretending you are one, pretending you have made solemn promises before God, sharing the physical symbols and the physical intimacy of your counterfeit union but then fleeing, retreating, severing all such other aspects of what was meant to be a total obligation? In matters of human intimacy, you must wait! You must wait until you can give everything, and you cannot give everything until you are legally and lawfully married. To give illicitly that which is not yours to give (remember, “you are not your own”) and to give only part of that which cannot be followed with the gift of your whole self is emotional Russian roulette. If you persist in pursuing physical satisfaction without the sanction of heaven, you run the terrible risk of such spiritual, psychic damage that you may undermine both your longing for physical intimacy and your ability to give wholehearted devotion to a later, truer love. You may come to that truer moment of ordained love, of real union, only to discover to your horror that what you should have saved you have spent, and that only God’s grace can recover the piecemeal dissipation of the virtue you so casually gave away. On your wedding day the very best gift you can give your eternal companion is your very best self—clean and pure and worthy of such purity in return. Thirdly, may I say that physical intimacy is not only a symbolic union between a husband and a wife—the very uniting of their souls—but it is also symbolic of a shared relationship between them and their Father in Heaven. He is immortal and perfect. We are mortal and imperfect. 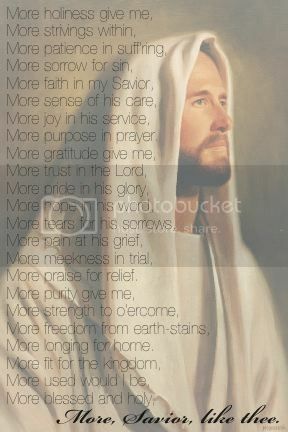 Nevertheless we seek ways even in mortality whereby we can unite with Him spiritually. In so doing we gain some access to both the grace and the majesty of His power. 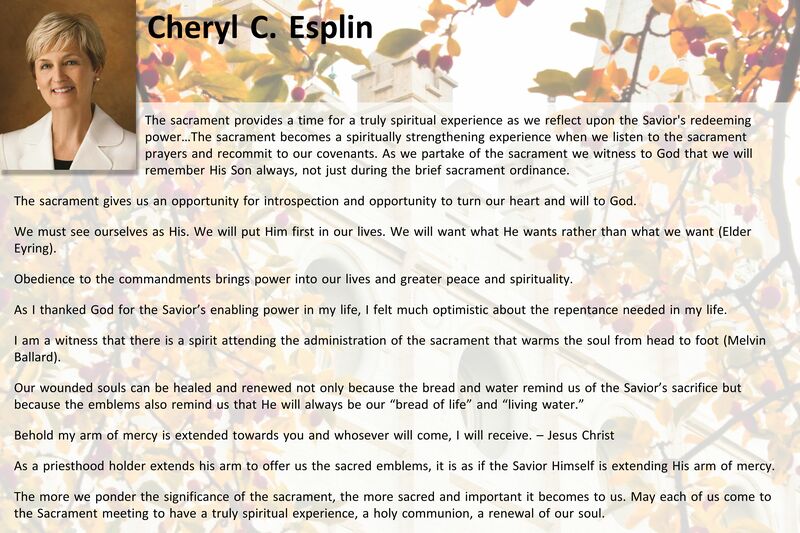 Those special moments include kneeling at a marriage altar in the house of the Lord, blessing a newborn baby, baptizing and confirming a new member of the Church, partaking of the emblems of the Lord’s Supper, and so forth. These are moments when we quite literally unite our will with God’s will, our spirit with His spirit, where communion through the veil becomes very real. At such moments we not only acknowledge His divinity but we quite literally take something of that divinity to ourselves. One aspect of that divinity given to virtually all men and women is the use of His power to create a human body, that wonder of all wonders, a genetically and spiritually unique being never before seen in the history of the world and never to be duplicated again in all the ages of eternity. A child, your child—with eyes and ears and fingers and toes and a future of unspeakable grandeur. Probably only a parent who has held that newborn infant in his or her arms understands the wonder of which I speak. Suffice it to say that of all the titles God has chosen for Himself, Father is the one He favors most, and creation is His watchword—especially human creation, creation in His image. You and I have been given something of that godliness, but under the most serious and sacred of restrictions. The only control placed on us is self-control—self-control born of respect for the divine sacramental power this gift represents. 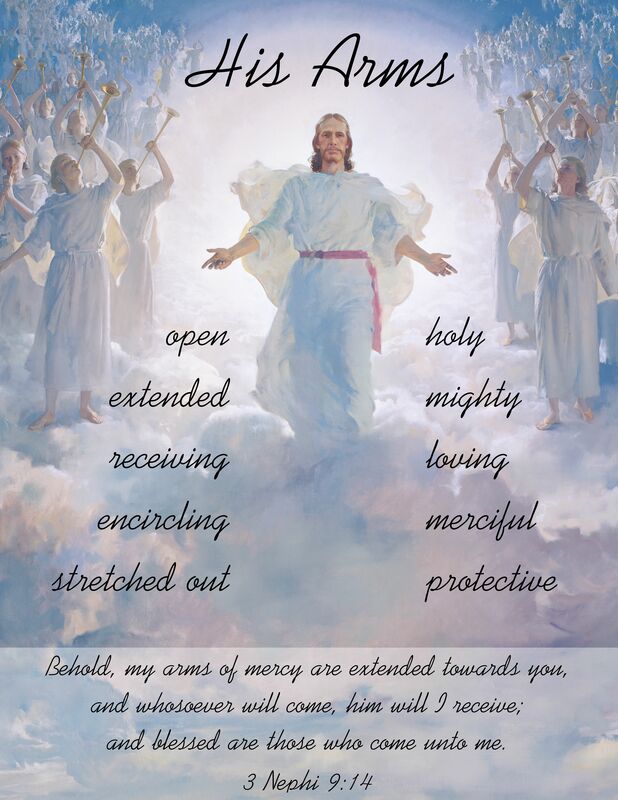 If some few of you are carrying such wounds—and I know that you are—to you is extended the peace and renewal of repentance available through the atoning sacrifice of the Lord Jesus Christ. In such serious matters the path of repentance is not easily begun nor painlessly traveled. But the Savior of the world will walk that essential journey with you. He will strengthen you when you waver. He will be your light when it seems most dark. He will take your hand and be your hope when hope seems all you have left. His compassion and mercy, with all their cleansing and healing power, are freely given to all who truly wish complete forgiveness and will take the steps that lead to it. I bear witness of the great plan of life, of the powers of godliness, of mercy and forgiveness and the Atonement of the Lord Jesus Christ—all of which have profound meaning in matters of moral cleanliness. 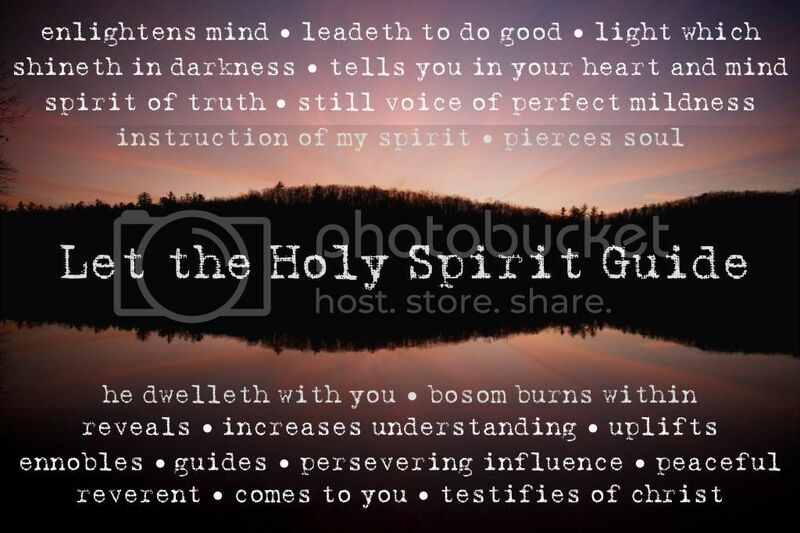 I testify that we are to glorify God in our body and in our spirit. I thank heaven for legions of the young who are doing just that and helping others do the same. I thank heaven for homes where this is taught. That lives of personal purity may be reverenced by all, I pray in the name of purity Himself, even the Lord Jesus Christ, amen. 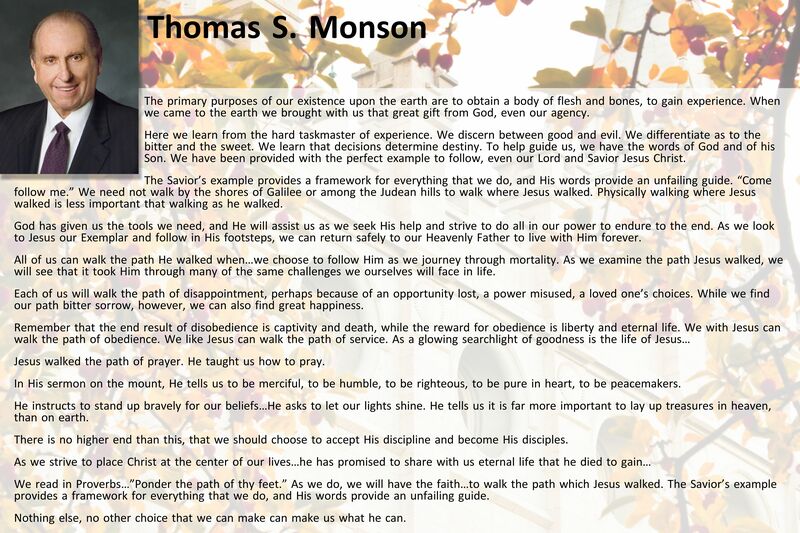 The Atonement endows us with every power necessary to convert our weaknesses into our strengths. 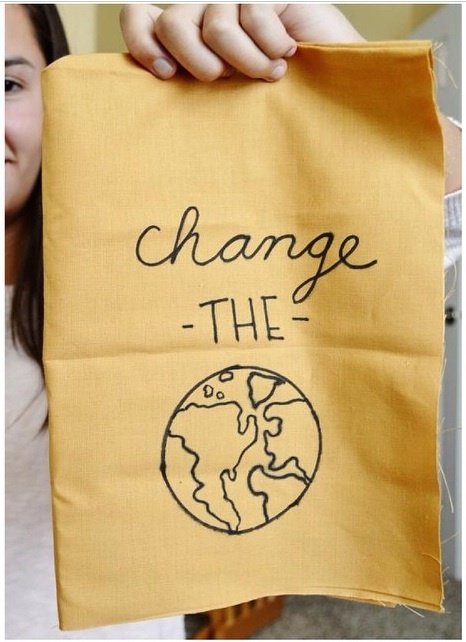 Encourage the youth to make a declaration of living a virtuous life (on paper or fabric as seen here). Thanks to Amy, one of my sweet Mia Maids, who followed through with the challenge and shared her picture on Instagram. 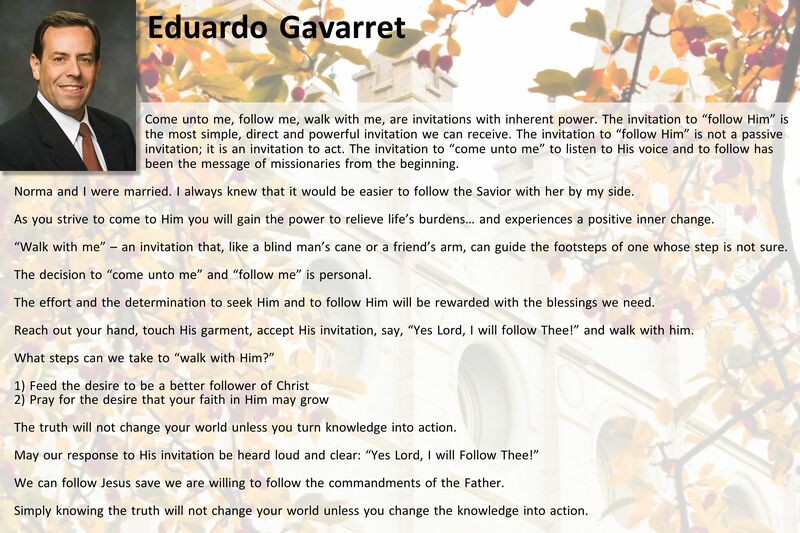 What an inspired group of topics we have to choose from this month from Come Follow Me. 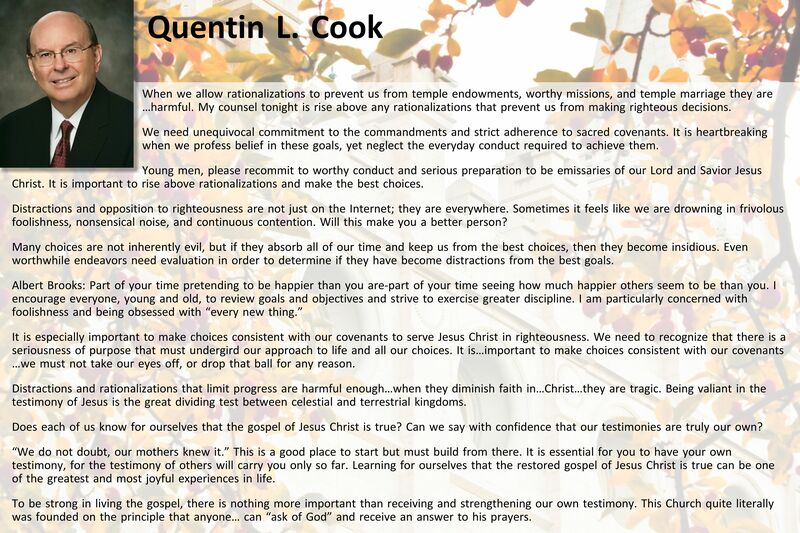 Today I’ve been studying a bit to help my hubby with his Priest Quorum lesson for tomorrow, and felt compelled to post a few thoughts. Maybe it will help one of you with your lesson preparation also. I’ll be honest, after I read through all of the suggested resources I took a nap (I’m still in recovery mode from a little surgery I had last week) but the nap served me well, because as I was drifting to sleep a memory from the past played out in my mind. As a young mother I loved telling my children stories, including favorites I had treasured growing up from the Grimm Brothers and Hans Christian Anderson. However, where I would merely tell the story to my children my husband would take it a step further. He was famous for acting out full renditions of stories such as, “The Three Little Pigs” and “Goldilocks and the Three Bears.” On his own, he played every character in the biggest and best way possible. Night after night the kids sat and laughed and laughed on the opposite side of the bedroom (it required a lot of space for the one man show). This soon became part of the bedtime ritual, requested after teeth were brushed and beds undone. But today, before I waited for sleep to come, the classic “The Shoemaker and the Elves” returned to me. Are you familiar with this timeless tale? A shoemaker, through no fault of his own, had become so poor that he had only leather enough for a single pair of shoes. He cut them out one evening, then went to bed, intending to finish them the next morning. Having a clear conscience, he went to bed peacefully, commended himself to God, and fell asleep. The next morning, after saying his prayers, he was about to return to his work when he found the shoes on his workbench, completely finished. Amazed, he did not know what to say. He picked up the shoes in order to examine them more closely. They were so well made that not a single stitch was out of place, just as if they were intended as a masterpiece. A customer soon came by, and he liked the shoes so much that he paid more than the usual price for them. The shoemaker now had enough money to buy leather for two pairs of shoes. That evening he cut them out, intending to continue his work the next morning with good cheer. But he did not need to do so, because when he got up they were already finished. Customers soon bought them, paying him enough that he now could buy leather for four pairs of shoes. Early the next morning he found the four pairs finished. And so it continued; whatever he cut out in the evening was always finished the following morning. He now had a respectable income and with time became a wealthy man. His wife agreed to this and lit a candle. Then they hid themselves behind some clothes that were hanging in a corner of the room. At midnight two cute little men appeared. Sitting down at the workbench, they picked up the cut-out pieces and worked so unbelievable quickly and nimbly that the amazed shoemaker could not take his eyes from them. They did not stop until they had finished everything. They placed the completed shoes on the workbench, then quickly ran away. I thought about each character’s significance in the story. What role did the father have? The mother? The elves?, How are the elves like a father? A mother? Our Heavenly Father?, and How did they help one another? These questions hit me. I began seeing symbolism everywhere in the story, even down to the perfect workmanship of the shoes; the divine potential of each child of God, nurtured and raised in a successful, loving, hardworking home. What more did you discover? Thank their mothers and fathers for specific ways they have been blessed because their parents fulfilled their divine roles. 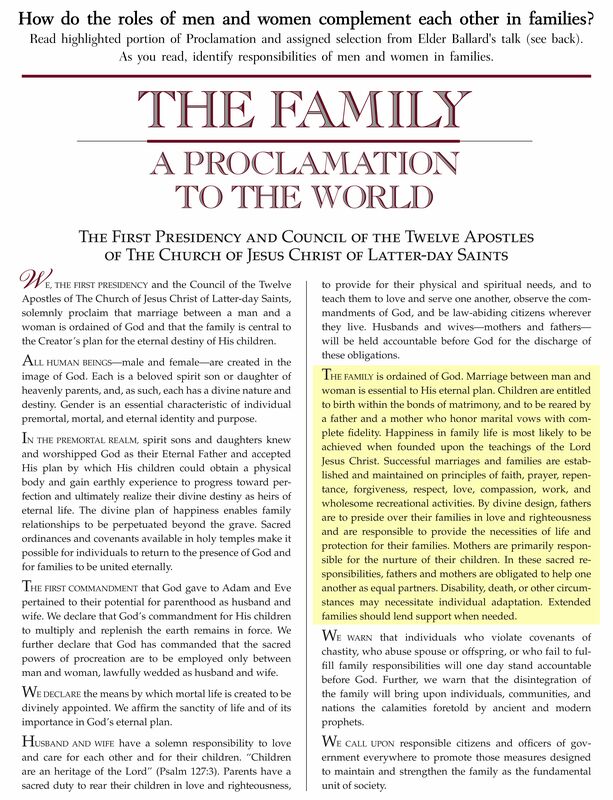 Select a phrase from “The Family: A Proclamation to the World” that would remind them of their divine roles as mothers or fathers. 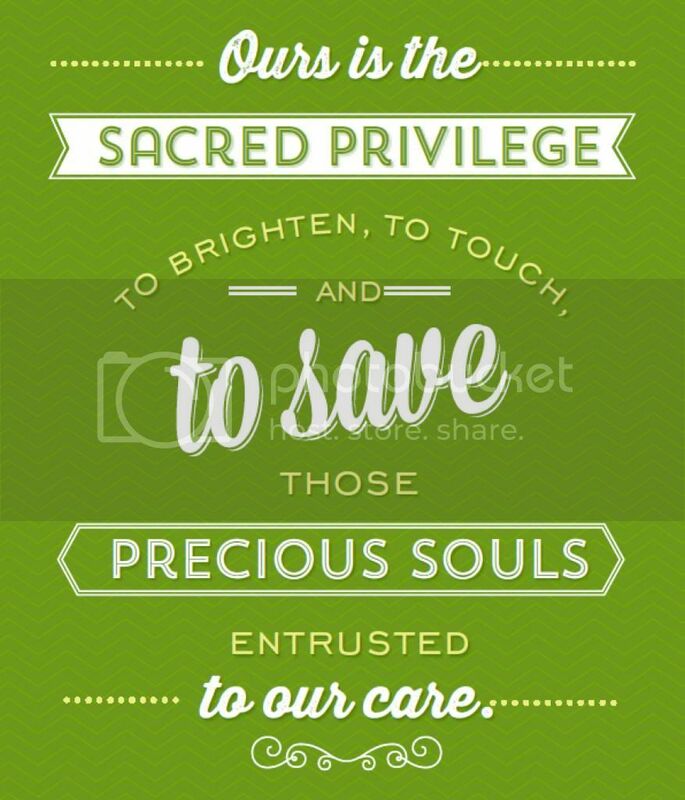 The virtue of kindness and its importance has consumed my thoughts lately. Maybe it’s the fact that we’re in the middle of summer vacation. I haven’t had a much of a break from the kids so kindness, freely given, is getting a little more difficult, especially around dinnertime. Perhaps the reminder has come in caring for a depressed neighbor this past week, searching for comfort during a painful family crisis. Or maybe its by just observing it in my community; seeing saddened faces in the aisles at the local grocery store. At any rate, The radio station survey was the final “nudge” I needed to get me to write my thoughts down. This post may only reach small numbers today, but in life some of the greatest things offered start very small, at times just a desire within our heart. . . Much, much smaller than an ELEPHANT for instance . 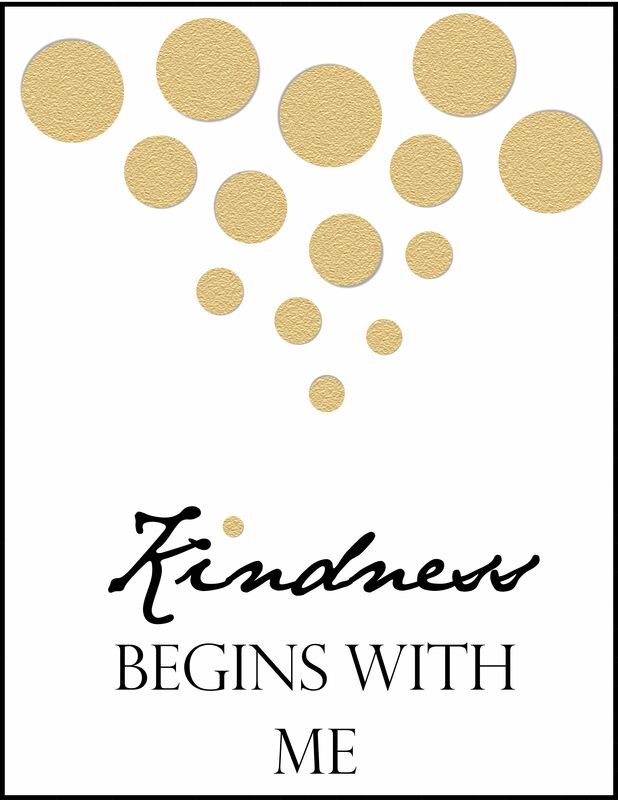 . .
Kindness is a virtue in many cultures and religions. 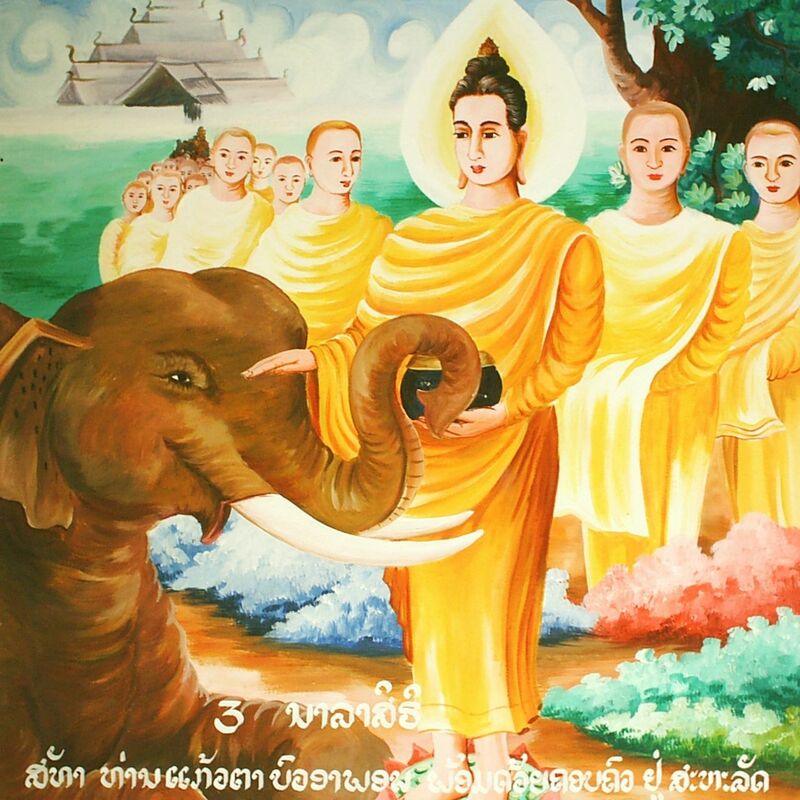 This picture depicts the parable of Buddha and the elephant Nalagiri. Devadutta, jealous of Buddha and wanting to hurt him, sent an angry elephant named Nalagiri into a street where Buddha and his colleagues were walking. As the angry Nalagiri approached them, Buddha’s loving kindness and friendliness tames Nalagiri. The parable teaches that kindness affects everyone. The elephant is also a symbol of remembering. We must remember that when we come upon an unhappy soul, instead of judging we show added compassion, we may not know the details of their troubles, but we do have the ability to know when someone needs a smile or a hello. How can I show greater kindness? “Many years ago, when I was called as a bishop, I had a desire for the bishopric to visit those who were less active in the Church and see if there was anything we could do to bring the blessings of the gospel into their lives. One day we visited a man in his 50s who was a respected mechanic. He told me the last time he had been to church was when he was a young boy. Something had happened that day. He had been acting up in class and was being noisier than he should when his teacher became angry, pulled him out of class, and told him not to come back. He never did. It was remarkable to me that an unkind word spoken more than four decades earlier could have had such a profound effect. But it had. And, as a consequence, this man had never returned to church. Neither had his wife or children. I apologized to him and expressed my sorrow that he had been treated that way. I told him how unfortunate it was that one word spoken in haste, and so long ago, could have the effect of excluding his family from the blessings that come from Church activity. “After 40 years,” I told him, “it’s time the Church made things right.” I did my best to do so. I reassured him that he was welcome and needed. I rejoiced when this man and his family eventually returned to church and became strong and faithful members. In particular, this good brother became an effective home teacher because he understood how something as small as an unkind word could have consequences that extend throughout a lifetime and perhaps beyond. Kindness is the essence of greatness and the fundamental characteristic of the noblest men and women I have known. Kindness is a passport that opens doors and fashions friends. It softens hearts and molds relationships that can last lifetimes. Kind words not only lift our spirits in the moment they are given, but they can linger with us over the years. One day, when I was in college, a man seven years my senior congratulated me on my performance in a football game. He not only praised how well I had done in the game, but he had noticed that I had showed good sportsmanship. Even though this conversation happened more than 60 years ago, and even though it’s highly unlikely the person who complimented me has any recollection of this conversation, I still remember the kind words spoken to me that day by Gordon B. Hinckley, who would later become President of the Church. The attributes of thoughtfulness and kindness are inseparably linked with President Hinckley. When my father passed away in 1963, President Hinckley was the first person to come to our home. I’ll never forget his kindness. He gave my mother a blessing and, among other things, promised her that she had much to look forward to and that life would be sweet for her. These words have brought comfort to her and to me, and I’ll never forget his kindness. Kindness is the essence of a celestial life. Kindness is how a Christlike person treats others. Kindness should permeate all of our words and actions at work, at school, at church, and especially in our homes. Jesus, our Savior, was the epitome of kindness and compassion. He healed the sick. He spent much of His time ministering to the one or many. He spoke compassionately to the Samaritan woman who was looked down upon by many. He instructed His disciples to allow the little children to come unto Him. He was kind to all who had sinned, condemning only the sin, not the sinner. He kindly allowed thousands of Nephites to come forward and feel the nail prints in His hands and feet. Yet His greatest act of kindness was found in His atoning sacrifice, thus freeing all from the effects of death, and all from the effects of sin, on conditions of repentance. There is no substitute for kindness in the home. This lesson I learned from my father. He always listened to my mother’s advice. As a result, he was a better, wiser, and kinder man. I have tried to follow my father’s example and listen to my wife’s point of view. I value her opinion. For example, when my wife begins a sentence with the words “I should think you would …” I instantly pay attention and begin searching my mind for something I may have done wrong. 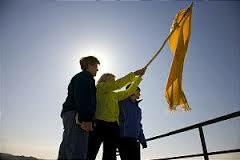 Ofttimes before my wife has finished her sentence, I have already planned out in my mind a magnificent apology. In truth, my wife is a model of kindness, gentleness, and compassion. And her insight, counsel, and support have been invaluable to me. Because of her I, too, am a wiser and kinder person. The things you say, the tone of your voice, the anger or calm of your words—these things are noticed by your children and by others. They see and learn both the kind and the unkind things we say or do. Nothing exposes our true selves more than how we treat one another in the home. I often wonder why some feel they must be critical of others. It gets in their blood, I suppose, and it becomes so natural they often don’t even think about it. They seem to criticize everyone—the way Sister Jones leads the music, the way Brother Smith teaches a lesson or plants his garden. Even when we think we are doing no harm by our critical remarks, consequences often follow. I am reminded of a boy who handed a donation envelope to his bishop and told him it was for him. The bishop, using this as a teaching moment, explained to the boy that he should mark on the donation slip whether it was for tithing, fast offerings, or for something else. The boy insisted the money was for the bishop himself. When the bishop asked why, the boy replied, “Because my father says you’re one of the poorest bishops we’ve ever had.” The Church is not a place where perfect people gather to say perfect things, or have perfect thoughts, or have perfect feelings. The Church is a place where imperfect people gather to provide encouragement, support, and service to each other as we press on in our journey to return to our Heavenly Father. Each one of us will travel a different road during this life. Each progresses at a different rate. Temptations that trouble your brother may not challenge you at all. Strengths that you possess may seem impossible to another. Never look down on those who are less perfect than you. Don’t be upset because someone can’t sew as well as you, can’t throw as well as you, can’t row or hoe as well as you. We are all children of our Heavenly Father. And we are here with the same purpose: to learn to love Him with all our heart, soul, mind, and strength, and to love our neighbor as ourselves. One way you can measure your value in the kingdom of God is to ask, “How well am I doing in helping others reach their potential? Do I support others in the Church, or do I criticize them?” If you are criticizing others, you are weakening the Church. If you are building others, you are building the kingdom of God. As Heavenly Father is kind, we also should be kind to others. Why? In the scriptures Jude taught, “And of some have compassion, making a difference.” Who can tell what far-reaching impact we can have if we are only kind? 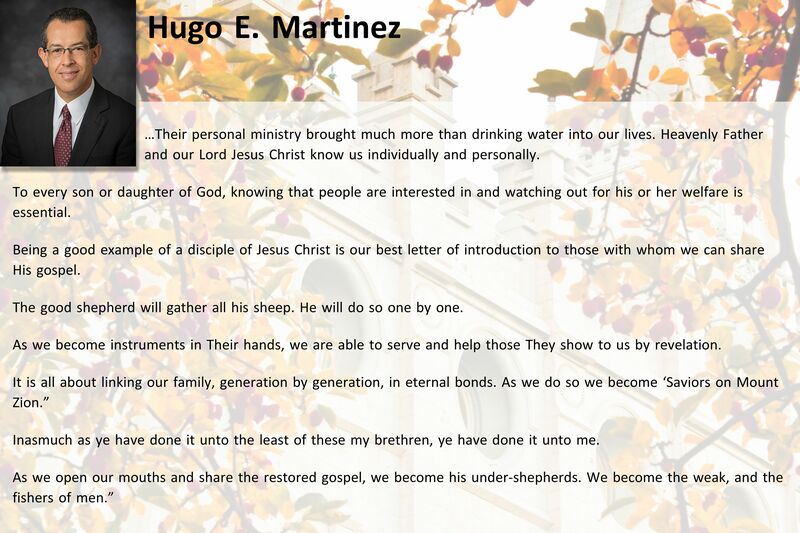 My brothers and sisters, the gospel of Jesus Christ transcends mortality. 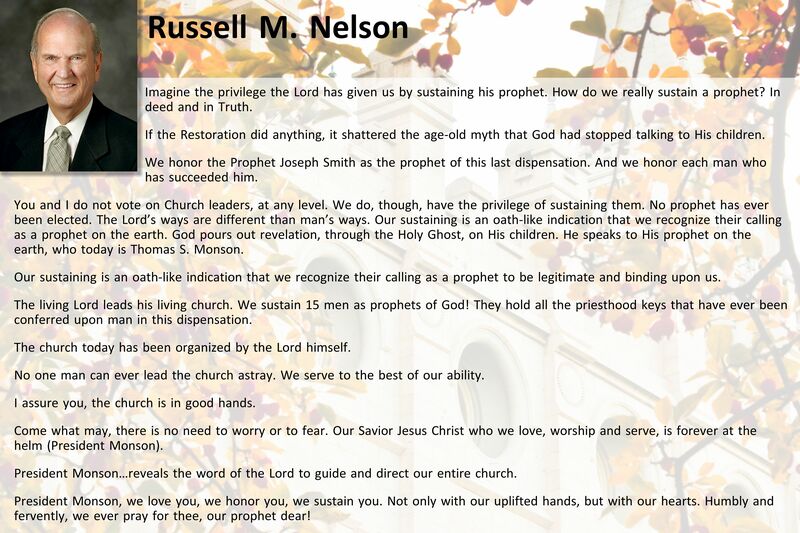 Our work here is but a shadow of greater and unimaginable things to come.The heavens opened to the Prophet Joseph Smith. He saw the living God and His Son, Jesus the Christ. In our day, a prophet, President Gordon B. Hinckley, walks the earth and provides direction for our time. As our Heavenly Father loves us, we also should love His children. May we be models of kindness. 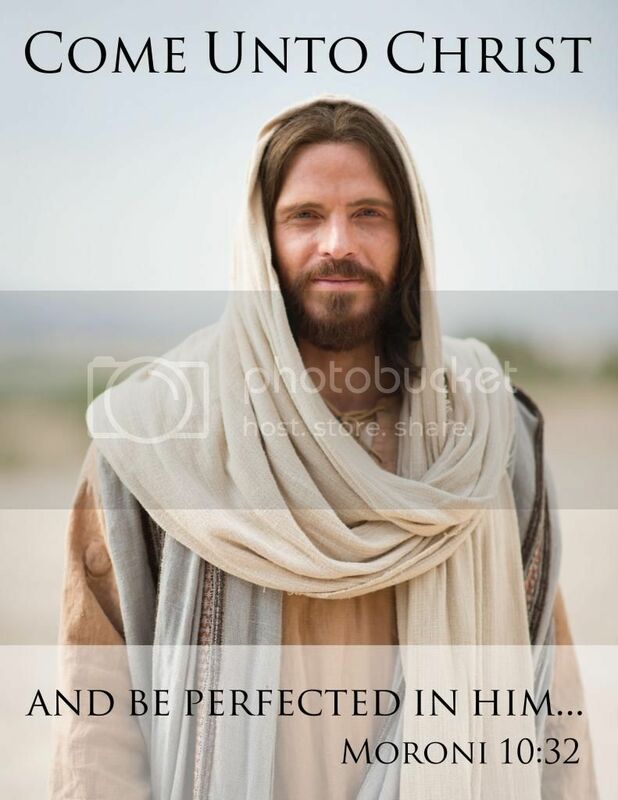 May we ever live up to the words of the Savior: “By this shall all men know that ye are my disciples, if ye have love one to another.” Of these truths I bear witness in the sacred name of Jesus Christ, amen. “I want to be kind to ev’ryone, For that is right, you see. Introduction: King Benjamin has finished giving his address and desires to know if his people believed the words he had spoken. 2 And they all cried with one voice, saying: Yea, we believe all the words which thou hast spoken unto us; and also, we know of their surety and truth, because of the Spirit of the Lord Omnipotent, which has wrought (caused) a mighty change in us, or in our hearts, that we have no more disposition to do evil, but to do good continually (conversion). Have you felt this mighty change in your heart? Are you working toward conversion? 5 And we are willing to enter into a covenant (sacred promise) with our God to do his will, and to be obedient to his commandments in all things that he shall command us, all the remainder of our days, that we may not bring upon ourselves a never-ending torment (knowing we did not receive celestial glory), as has been spoken by the angel, that we may not drink out of the cup of the wrath of God. 7 And now, because of the covenant which ye have made ye shall be called the children of Christ, his sons, and his daughters; for behold, this day he hath spiritually begotten you; for ye say that your hearts are changed through faith on his name; therefore, ye are born of him (spiritually) and have become his sons and his daughters. How has your heart or actions changed because of your faith in Him? 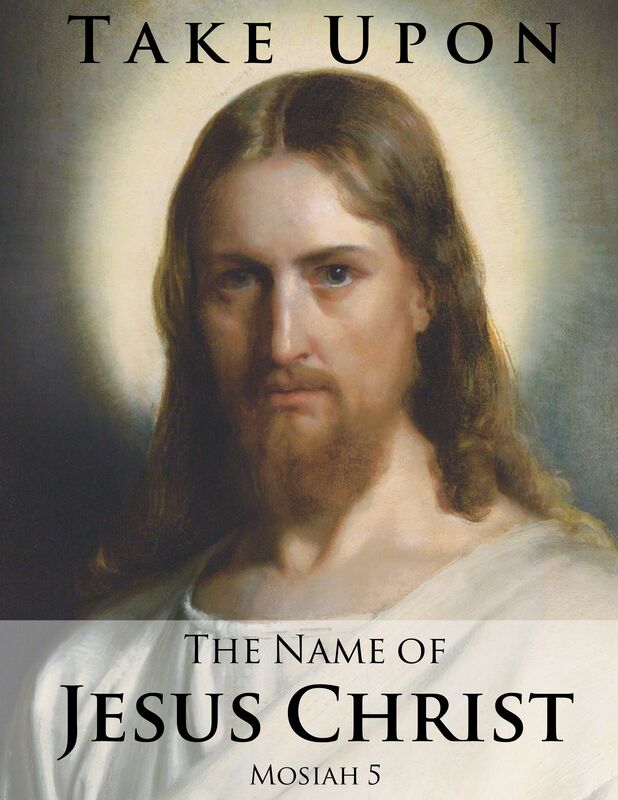 Each time you read the word “name” in the following verses, think of Jesus Christ:8 And under this head ye are made free, and there is no other head whereby ye can be made free (Jesus Christ). 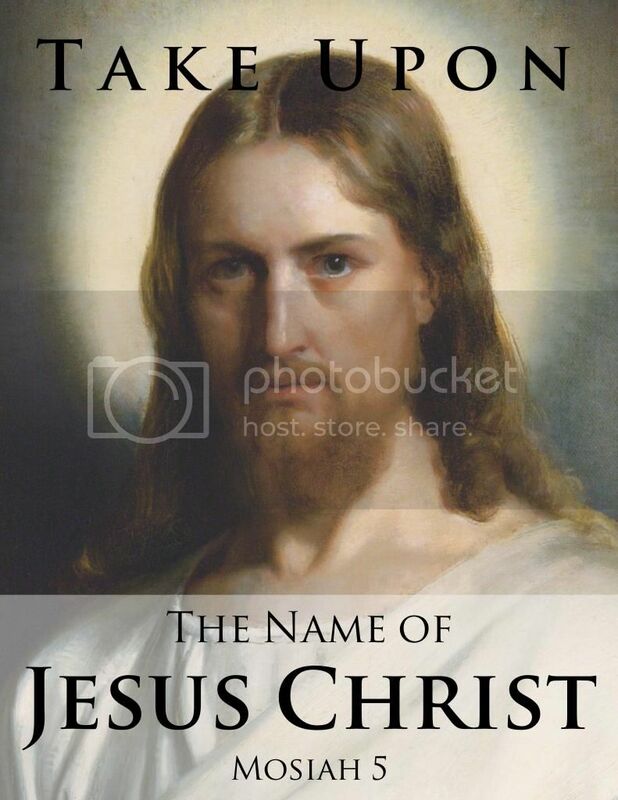 There is no other name given whereby salvation cometh; therefore, I would that ye should take upon you the name of Christ, all you that have entered into the covenant with God that ye should be obedient unto the end of your lives. 9 And it shall come to pass that whosoever doeth this shall be found at the right hand of God, for he shall know the name by which he is called; for he shall be called by the name of Christ. Who will be found on the right hand of God? 10 And now it shall come to pass, that whosoever shall not take upon him the name of Christ must be called by some other name; therefore, he findeth himself on the left hand of God. 11 And I would that ye should remember also, that this is the name that I said I should give unto you that never should be blotted out, except it be through transgression; therefore, take heed that ye do not transgress, that the name be not blotted out of your hearts. 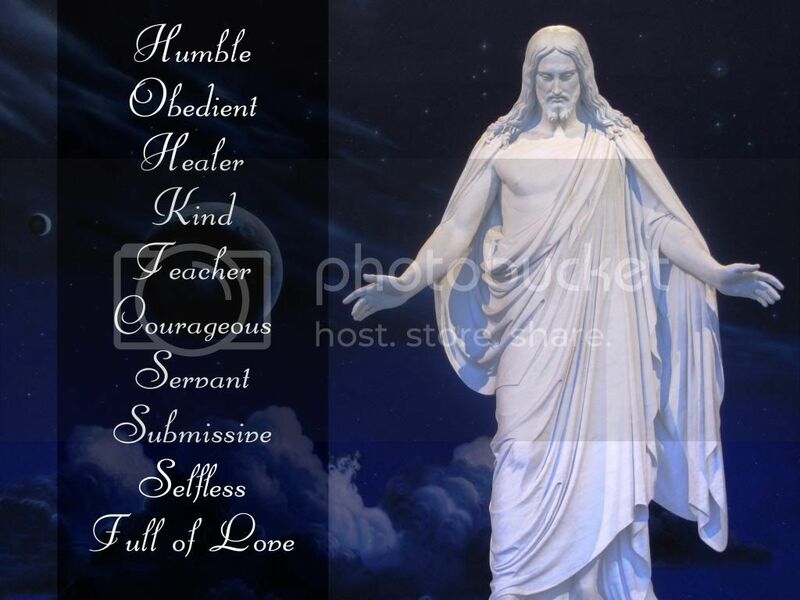 12 I say unto you, I would that ye should remember to retain thename written always in your hearts, that ye are not found on the left hand of God, but that ye hear and know the voice by which ye shall be called, and also, the name by which he shall call you. Do you know of Christ? OR Do you KNOW Christ? How can I fulfill the covenant I have made? 15 Therefore, I would that ye should be steadfast and immovable, always abounding in good works, that Christ, the Lord God Omnipotent, may seal you his (children of Christ), that you may be brought to heaven, that ye may have everlasting salvation and eternal life, through the wisdom, and power, and justice, and mercy of him who created all things, in heaven and in earth, who is God above all. Amen. I renew the covenant I made at baptism. 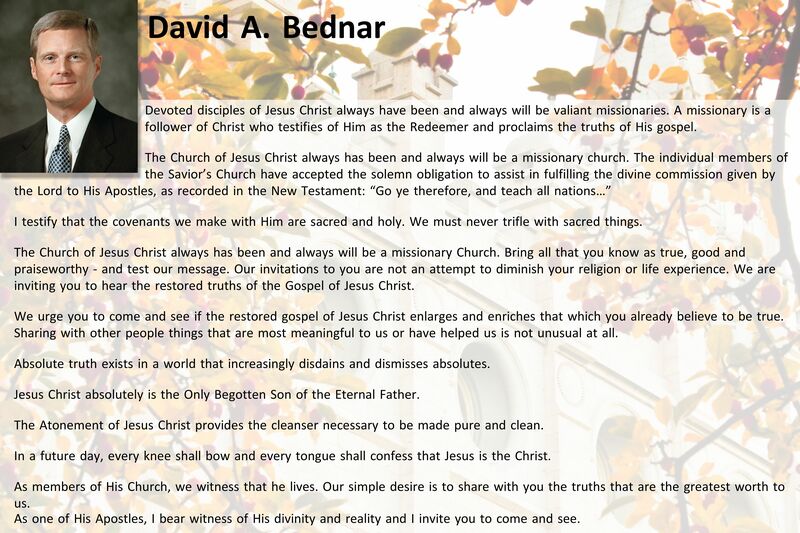 I become a member of the Church that bears His name. I publicly proclaim my belief in Him. I am willing to do the work in His Kingdom. 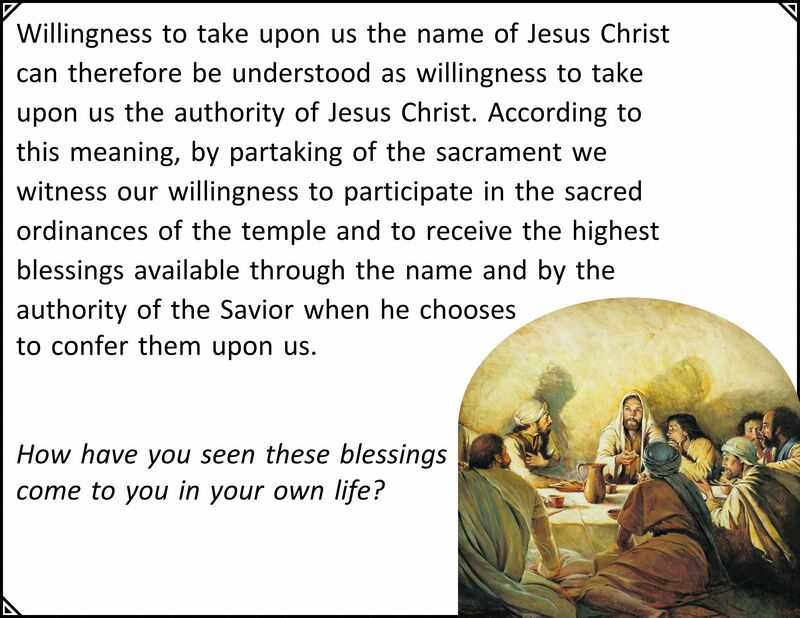 I will participate in the sacred ordinances of the temple and to receive the highest blessings available through his name and authority. 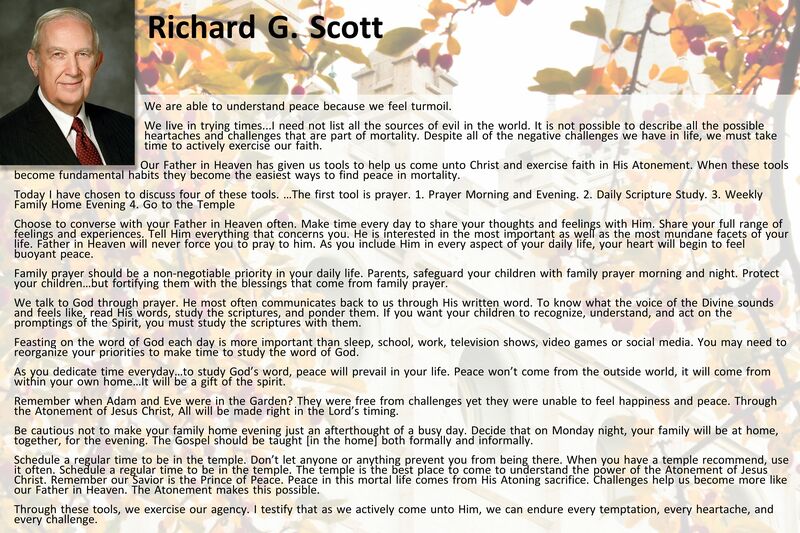 I commit to do all that I can to achieve eternal life in the Kingdom of our Father. I do all that I can to be counted among those whom he will choose to stand at his right hand and be called by his name at the last day. 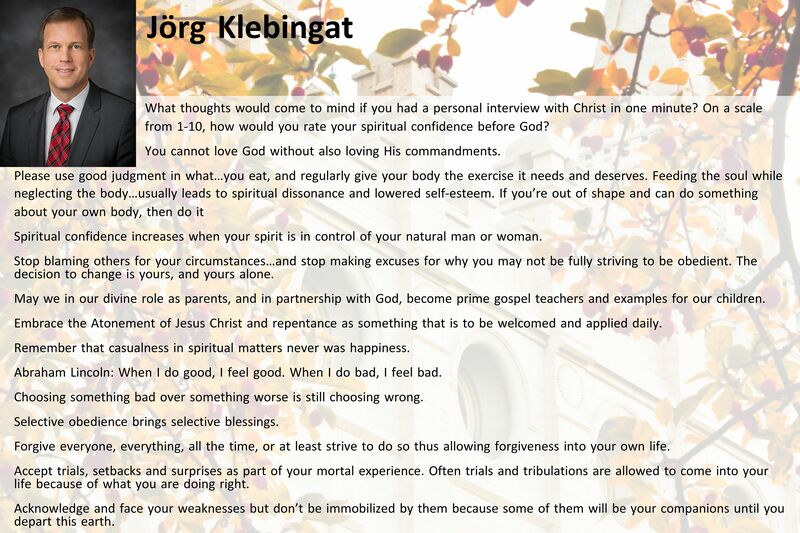 Download the worksheet What does it mean to take upon myself the name of Jesus Christ for each classmember. These are his words: In St. George we arranged for a tent for my health and comfort, with a built-in floor raised about a foot above the ground, and we could roll up the south side of the tent to make the sunshine and fresh air available. I became so weak as to be scarcely able to move. It was a slow and exhausting effort for me even to turn over in bed. One day, under these conditions, I lost consciousness of my surroundings and thought I had passed to the other Side. I found myself standing with my back to a large and beautiful lake, facing a great forest of trees…. I realized, or seemed to realize, that I had finished my work in mortality and had gone home…. I began to explore, and soon I found a trail through the woods which seemed to have been used very little, and which was almost obscured by grass. I followed this trail; and after I had walked for some time and had traveled a con­siderable distance through the for­est, I saw a man coming towards me. I became aware that he was a very large man, and I hurried my steps to reach him, because I recognized him as my grandfather. In mortality, he weighed over three hundred pounds, so you may know he was a large man. I remember how happy I was to see him coming, I had been given his name and had always been proud of it. Let me share with you the story of an sister from the former communist East Germany, Sister Gertrud Barthel. 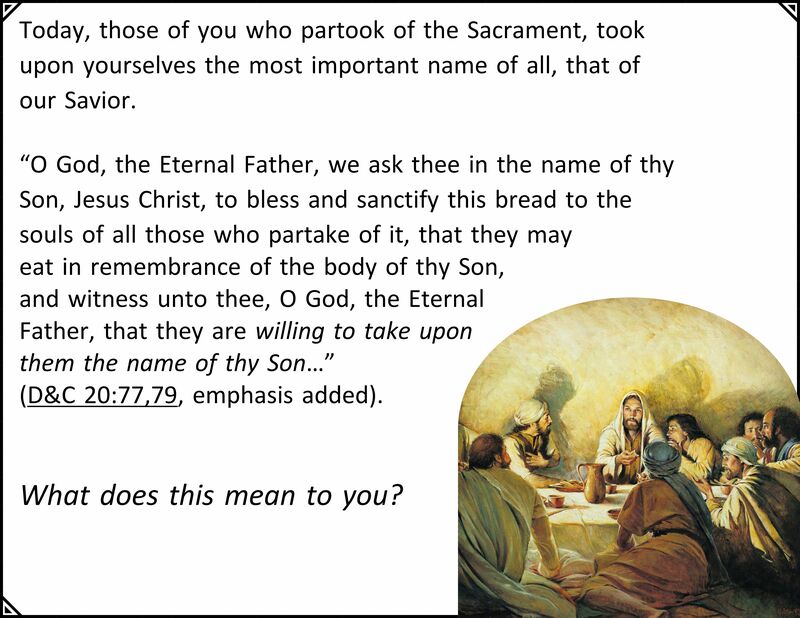 I believe Sister Barthel has truly taken upon herself the name of Christ. Over the past few years, I have had the opportunity on several occasions to travel to the former East Germany. When I have visited there, I have particularly enjoyed meeting those who were members of the Church during the communist times. They had to deal with a government that taught that there was no God and actively discouraged religious activity. In addition, the government officials were concerned about potential threats to their control, so they organized a secret policy force, the State Security force, better known as the Stasi. The Stasi collected records of activities of individuals they considered as possible threats. They collected this information through a huge network of informers. The informers were sometimes volunteers but many were coerced into spying on their neighbors. Often the informers provided information on the activities of other informers. One could describe East Germany as a nation of spies spying on other spies. Sister Barthel joined the Church as a teenager in the late 1940s as the communist government was initially coming into power. Since the Communists had prohibited the printing of religious texts, she did not have her own scriptures until several years after she was baptized. She watched the separation of Germany into two countries, one communist and one democratic, from the east side of the wall. In the early 50s she married. Her husband was not a member of the Church and still is not a member. Her daughter followed the communist anti-religion dogma and did not become involved with Church. Despite this lack of support, Sister Barthel remained an active member of the small Werdau Branch throughout the communist era. This dedication to the Church during the difficult and challenging Communist era in and of itself might be a demonstration of her commitment to taking upon herself the name of the Savior. However, there is more to this story. In 1989, the wall came down, and the East Germans were finally free. As it became clear that the communist regime was crumbling, the Stasi officers attempted to destroy the huge volume of files that they had accumulated on their fellow citizens. This was an act of self-preservation for them. They didn’t want the East German citizens to discover what they had done. However, the citizens were well-aware of the Stasi’s activities, and they rushed to the Stasi offices to prevent the destruction of the files. Most of the files were saved, and they are now public records open to anyone who wants to look at the information that the Stasi collected from their network of informers. Included in the files are the names of those informers who reported on their fellow citizens. Nothing good could come of that! What a remarkable attitude of love and forgiveness from a remarkable sister. Has she adopted the attributes of being a disciple of Christ in her life? Absolutely! Has she differentiated herself in her attitudes and behavior? Definitely! Has she consistently lived according to her beliefs? Certainly! My name is Carrie McEwan. 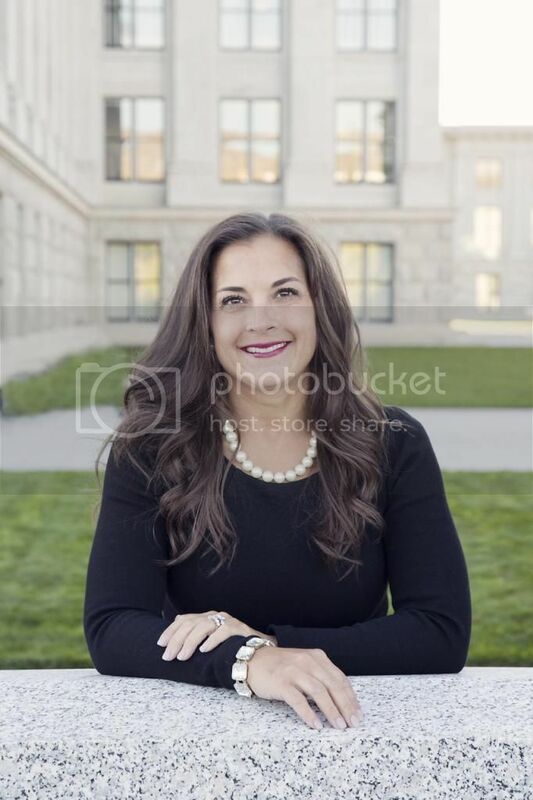 I'm a wife, a mother, an identical twin and I'M A MORMON. 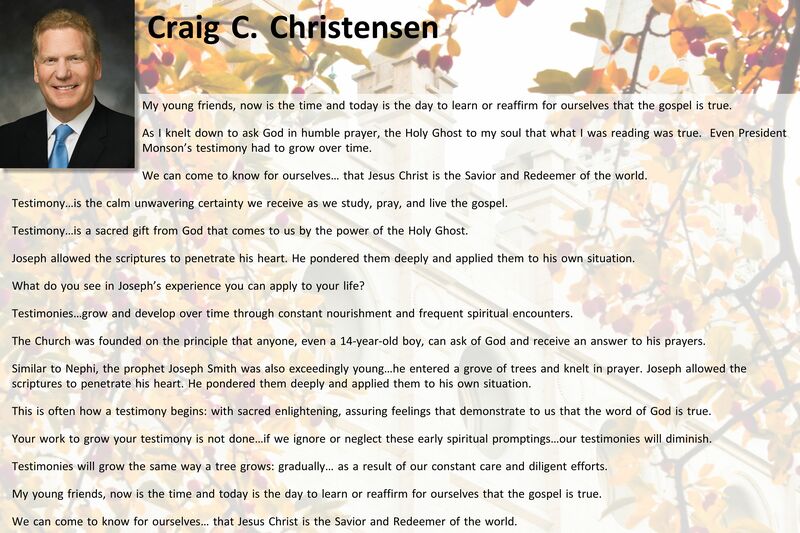 How can I strengthen my testimony? 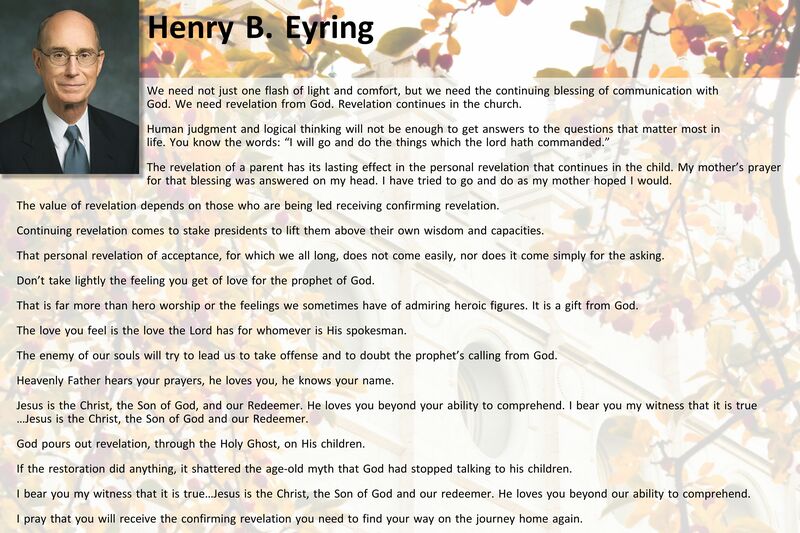 How do I receive personal revelation?